Currently, the kids are riding on donated bikes that are over 20 years old, and upgraded department store bikes. And while they are winning events and placing, they are really outclassed when it comes to equipment. These kids are poor, and all come from broken homes with no revenue resources. The team now has six full time riders and there are six more on the waiting list who train with the team. 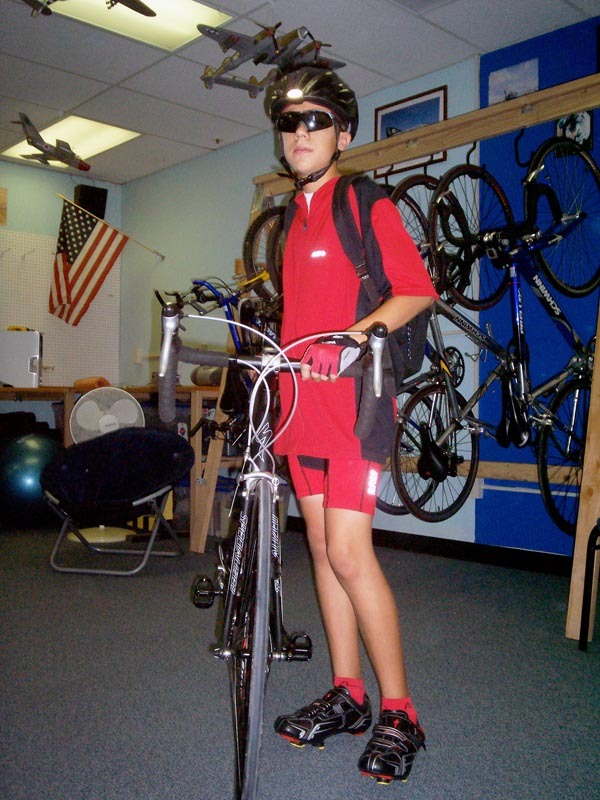 With our donation and the equipment he currently has, John could easily expand the program to around 20 riders. 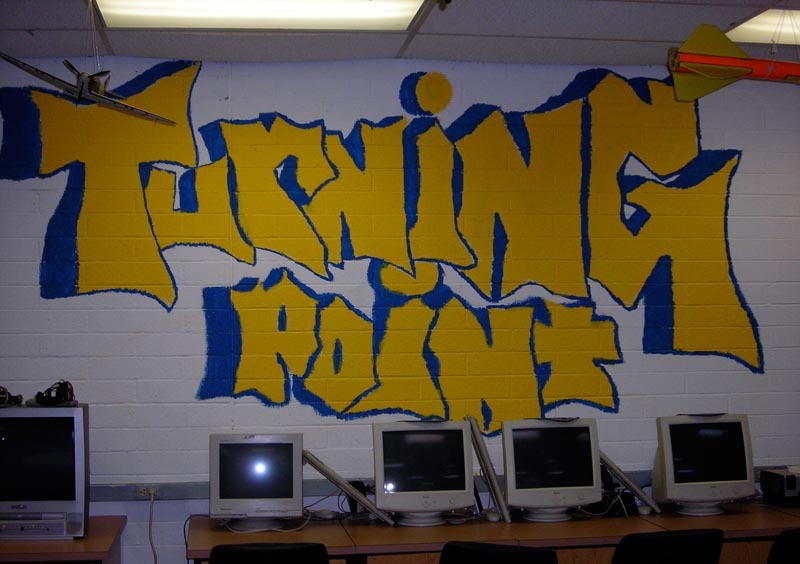 "Turning Point is is alive and well! 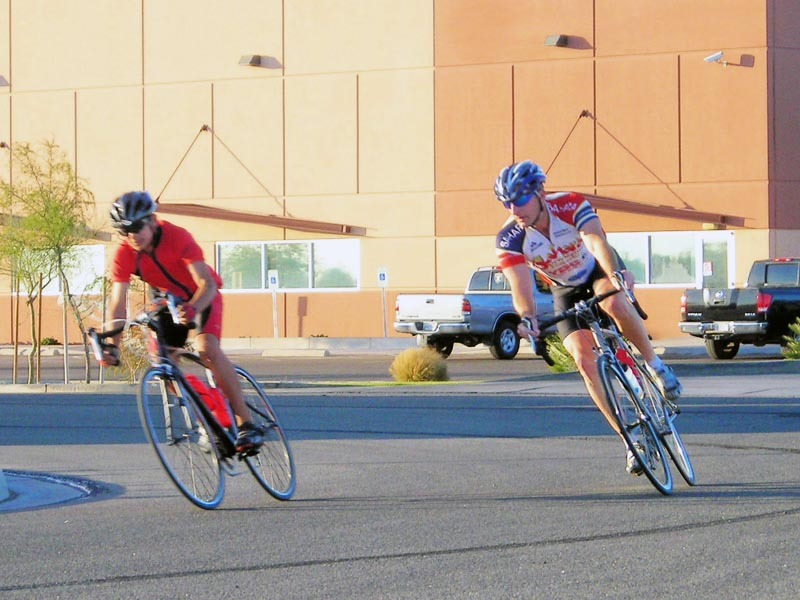 Our racers are still very active and are even branching out into triathalons now. 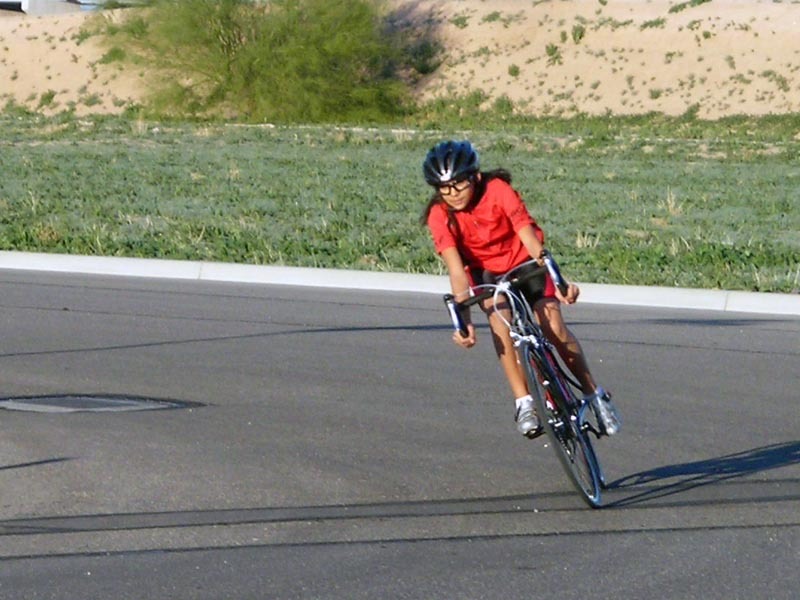 Our new governing board president is very active in getting the kids to races and training and as always Claudia and Isaac are instramental in keeping bills paid, everyone fed, and the bikes are running. 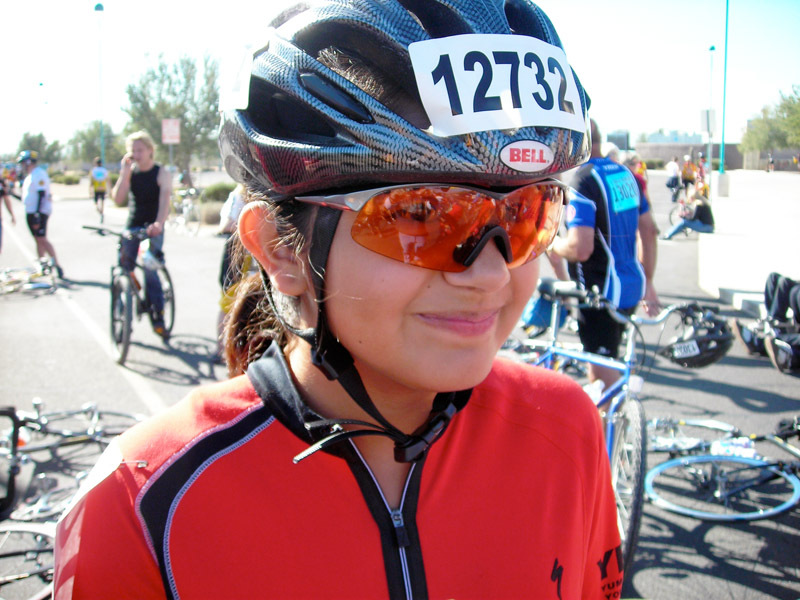 This little organization that Jenny started and with continued support from Time Warner Communications is still doing well finding at-risk children and giving them a chance to excell in endurance team sports. They train hard, race hard, and win! But we wouldn't be where we are today without the help from Jenny Jones that got us started with $50,000. We are grateful for the start that she gave us and are proud of what our kids have achieved through hard work and dedicated sacrafice. Thank you Jenny! - John McBride"
"It was an exciting three days, three cities race. There was four national junior teams there as well as teams from New York, New Jersey, Colorado, Utah, Texas, as well as several from California. There was the current junior national champion as well as former pro racer and Tour de France winner Floyd Landis. But they rose to the challenge and held their own. 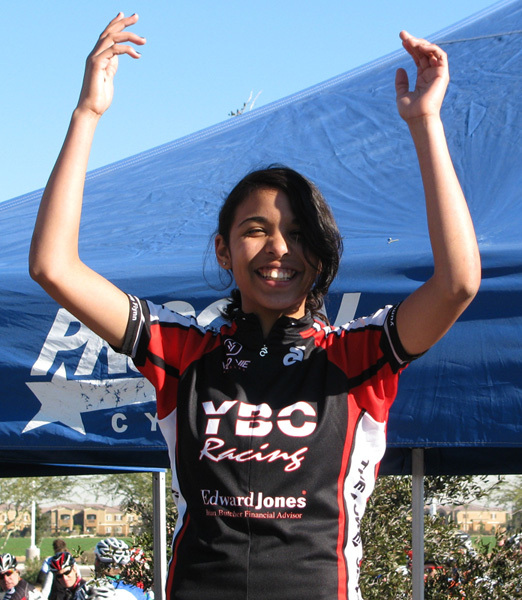 Syria Zepeda was the overall GC winner for the 12-14 year old girls. Taking the race leader's jersey and holding it all three days. 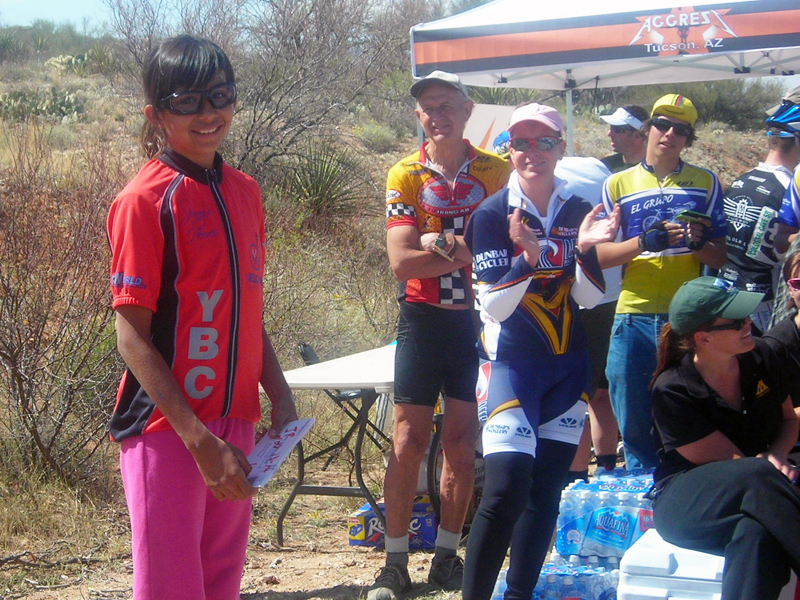 She won first place in the time trial and first in the junior women's road race. She took second on the final day in the criterium to have an over-all lead of 3:41 seconds over the next fastest junior woman. 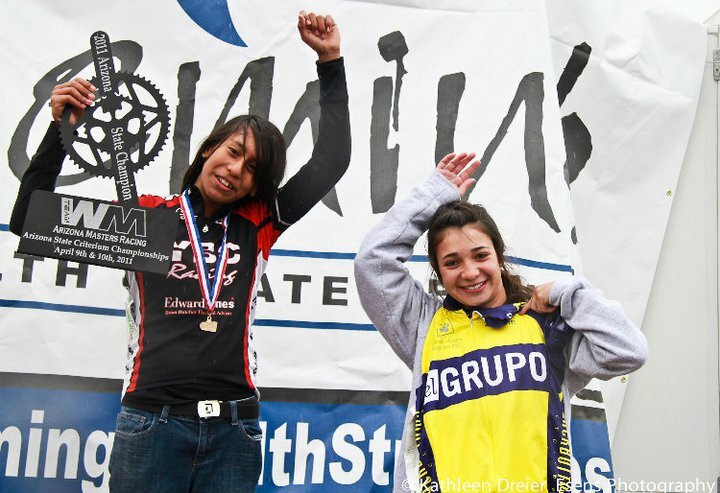 Andrea Garcia-Brown battled through illness to take third place in the 12-14 junior women's. She battled back on the second day of the gruelling road race to take second place and held her time lead in the final day to take the podium. 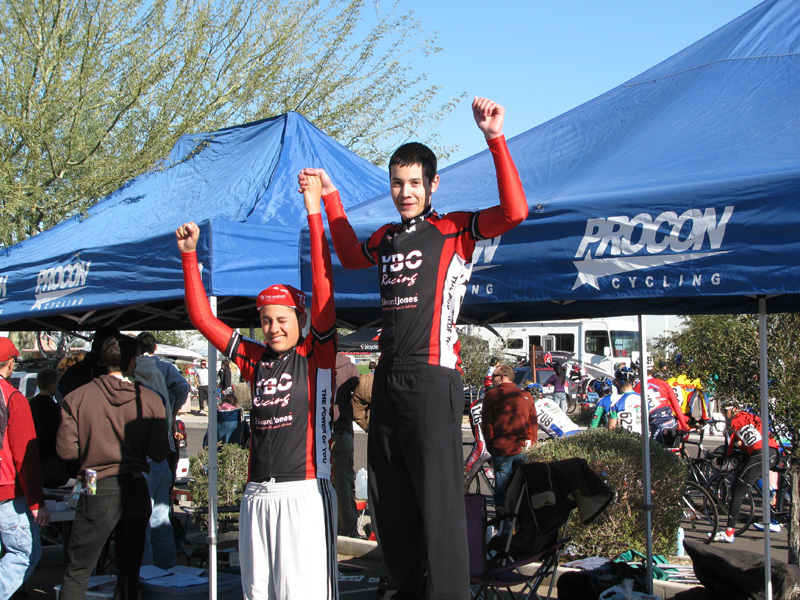 Walter Lopez and Josh Hansen worked well together to take 4th and 5th place and the podium in the overall GC points. 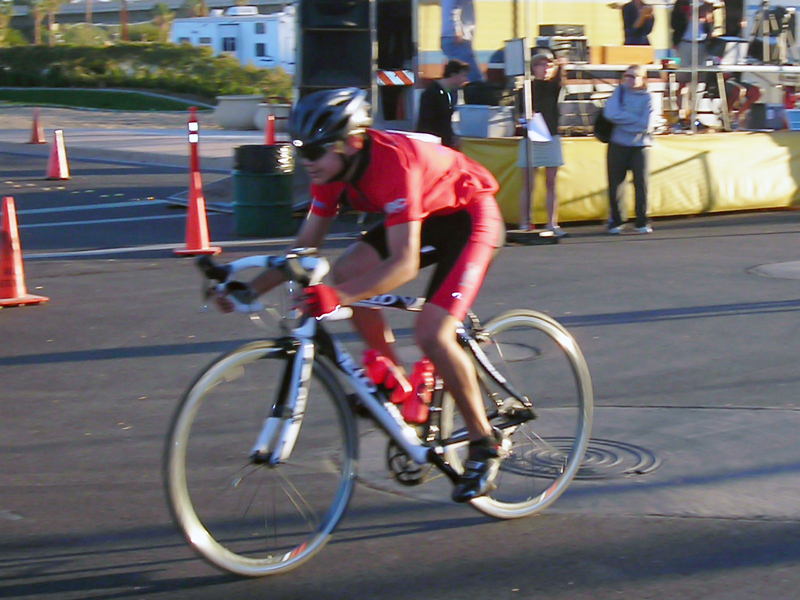 Walter took 5th place in the individual time trial, 4th place in the road race, and 6th place in the criterium. Josh Hansen was only 5 seconds behind him in three days of racing taking 6th place in the time trial, 2nd place in the road race, and 4th place in the criterium. 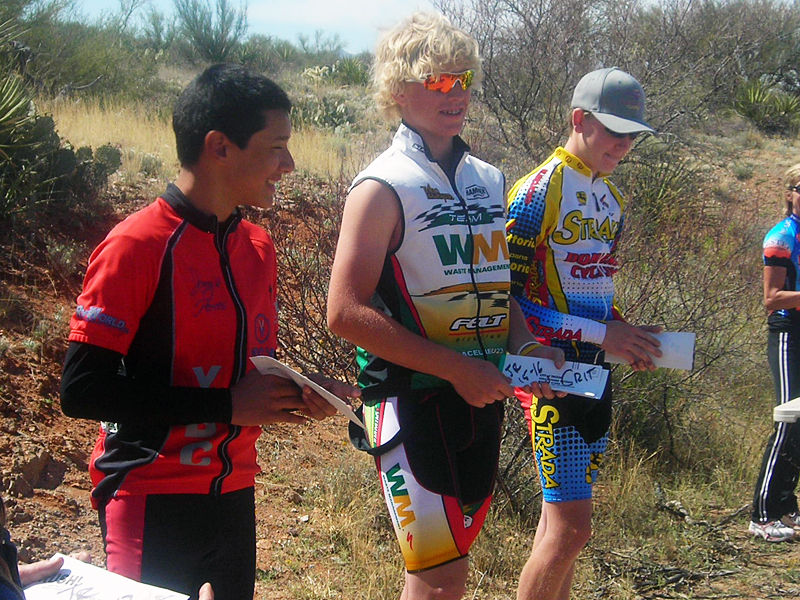 Out of eight riders on the Yuma travel team 4 took the podium! Alex Vieyra finished 24th in the junior men's 15-16 category against some national level competition and Jesse Zepeda was right behind him at 25th place. 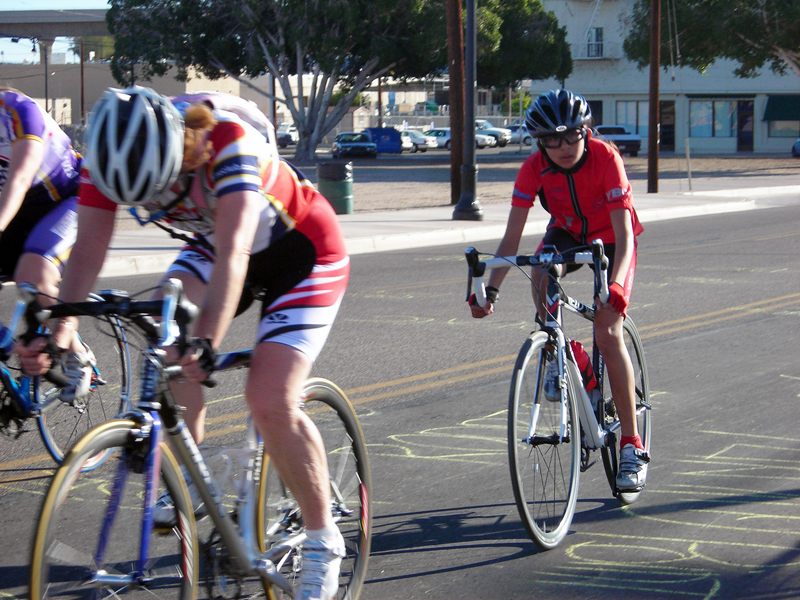 Average speeds in the criterium reached 25 mph! 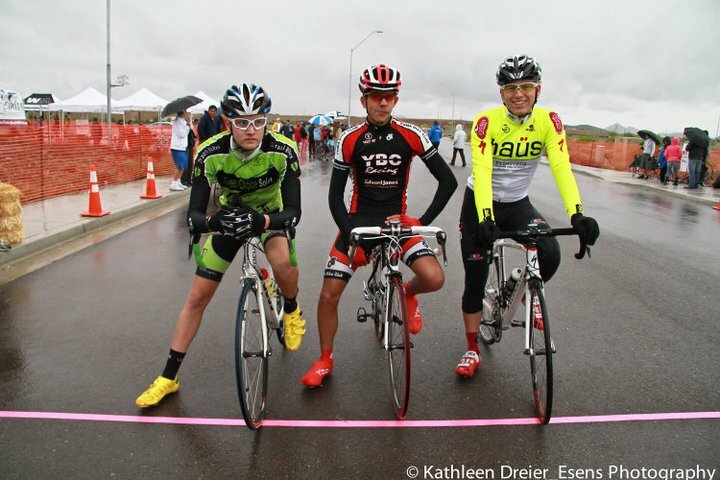 These kids are as close to the pro category as you can get and are the future of our sport. 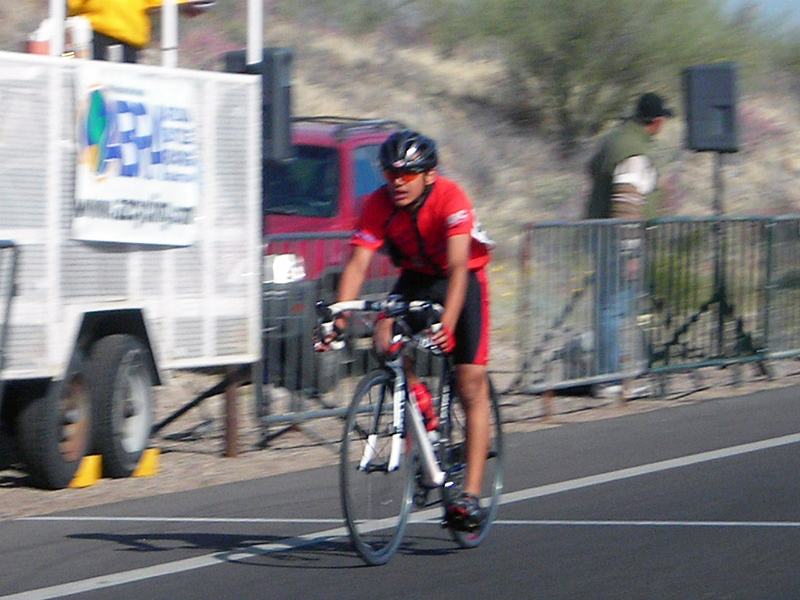 Genaro Diaz finished 26th place and Primo Youcopicio finished 31st in the challenging junior men's 17-18 category. 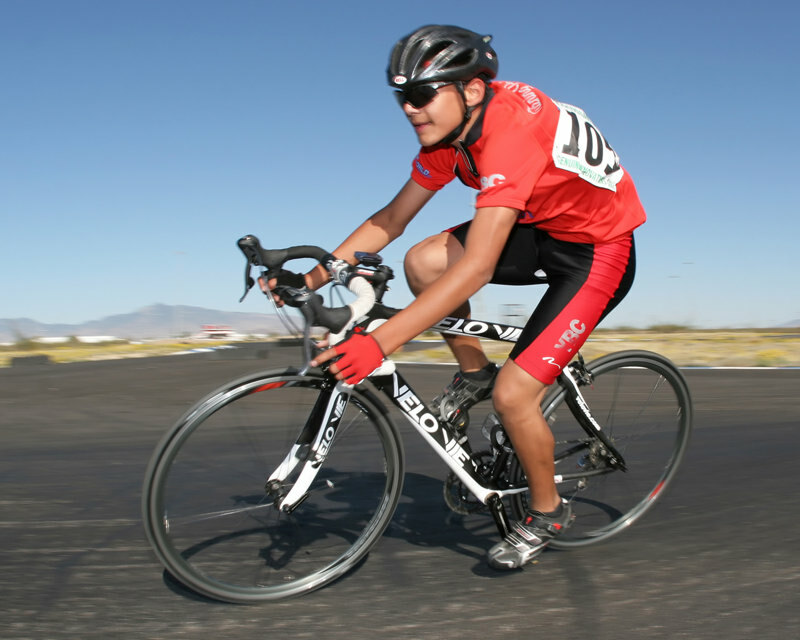 The 57 mile road race in the arid desert heat would have challenged the most able of riders. 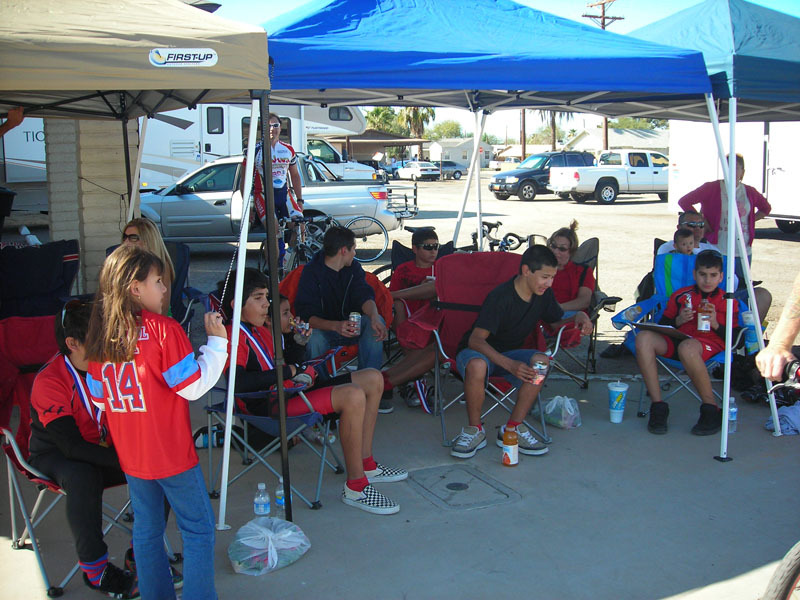 Overall the kids from Yuma met the national competition and held their own! We are so proud of these fine local athletes!" 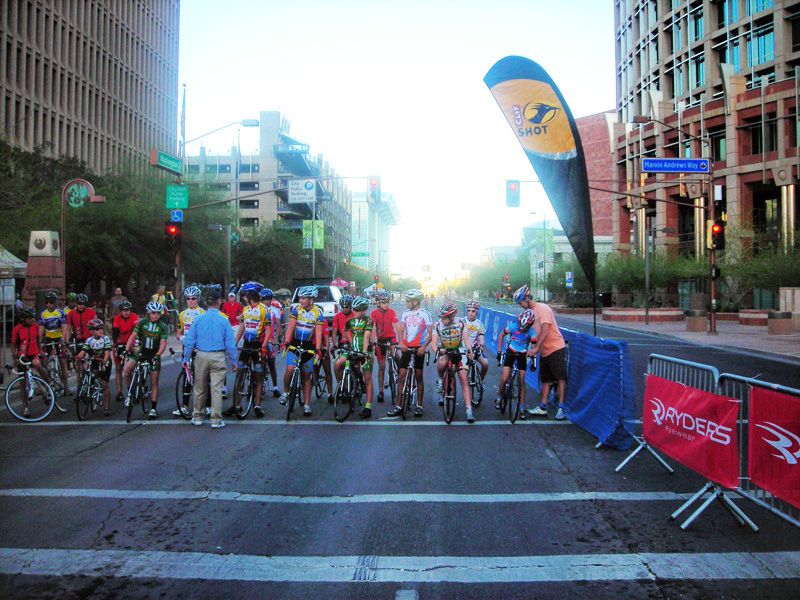 "The University of Arizona Criterium was marked by some of the largest junior fields in recent history. 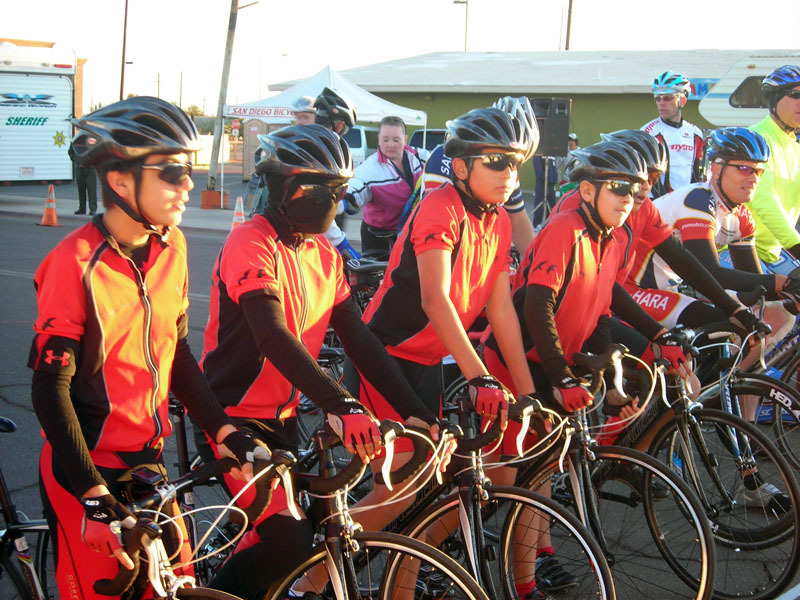 Over 44 junior riders from around the state competed in this fast, tight cornering event. 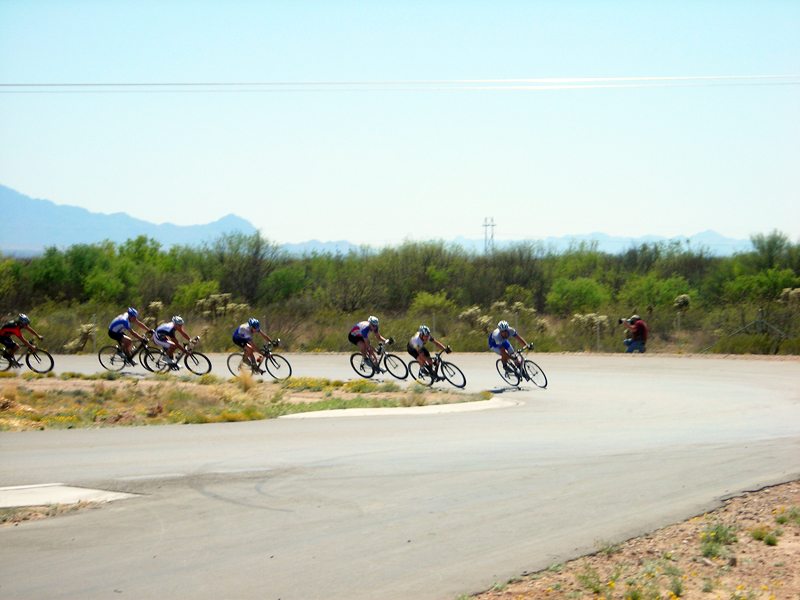 Several older juniors came out of the category 3-4 for adult fields to race this event as juniors providing stiff competition for the Yuma team. Alex Viereya, normally a defensive rider and category 5 junior saw the danger posed by the attacks of the older, higher ranked riders and rose to the challenge. 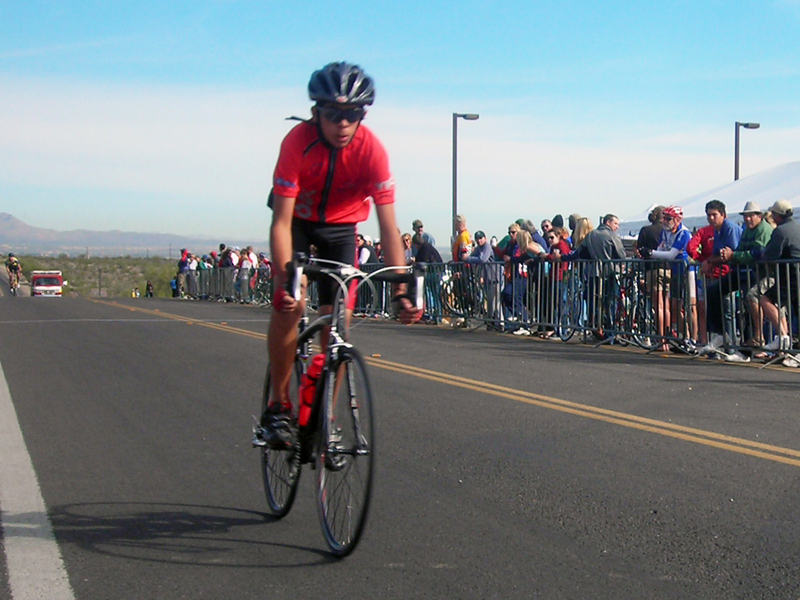 Instantly pulling to the front of the chase group he pursued with vigor and determination. 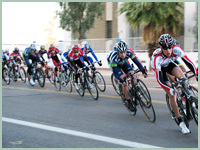 He closed the gap between the pursuit and the breakaway to ten seconds, but could not get any help from his team-mates who did not realize that there was a successful break away. Alex led the charge for almost three quarters of the race and finished a weary, but respectable 4th place for the highly competitive 15-16 year old division. Syria Zepeda continues to build upon her three championship wins from last season by winning another first place finish in her first race of 2010! 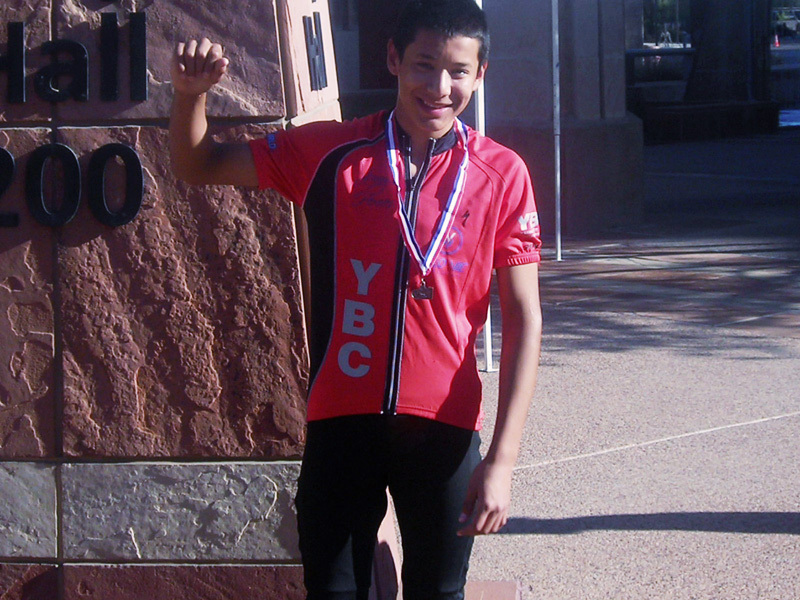 Undefeated Syria Zepeda from YBC Racing shows the true grace of a champion. Giving the boys a stiff run for their money and overlapping the entire junior women's field she clinched yet another victory in her belt for her first race of 2010. At the end of the race Syria caught up with her closest competitor and joining hands crossed the finish line with the El Gruppo rider showing her respect for a fellow competitor. 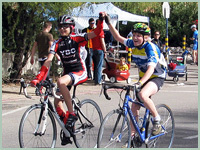 The crowd cheered as the two girls crossed the line together hands held high in victory and comraderie. Still wearing her new Time Warner Communications uniform Syria later assisted an injured adult rider who crashed on the 90 degree turn one. Offering him tools to fix his bike and wearing the red bandnna of her idol Thomas Schmunk as well as her trade-mark goggles; the adult rider asked, "Where do cool kids like you come from?" 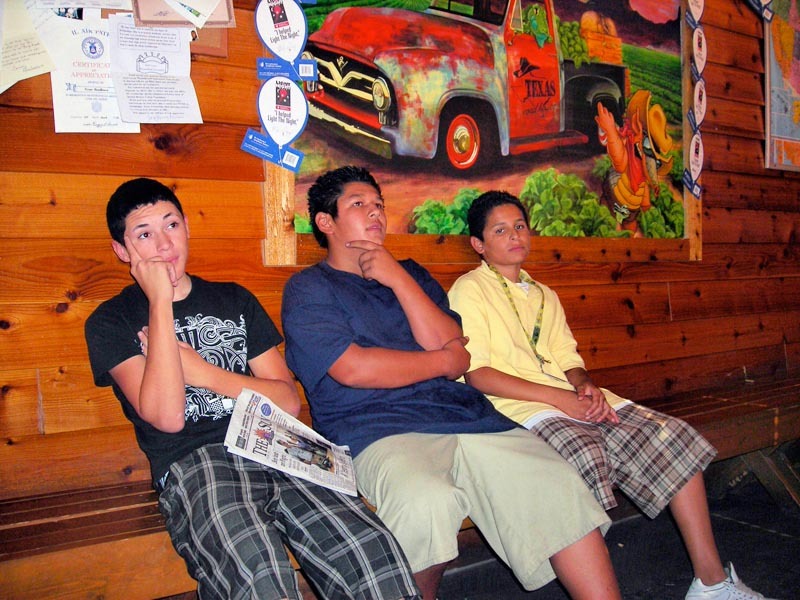 John sent us an email update entitled "Those Yuma Kids Are Doing It Again!" 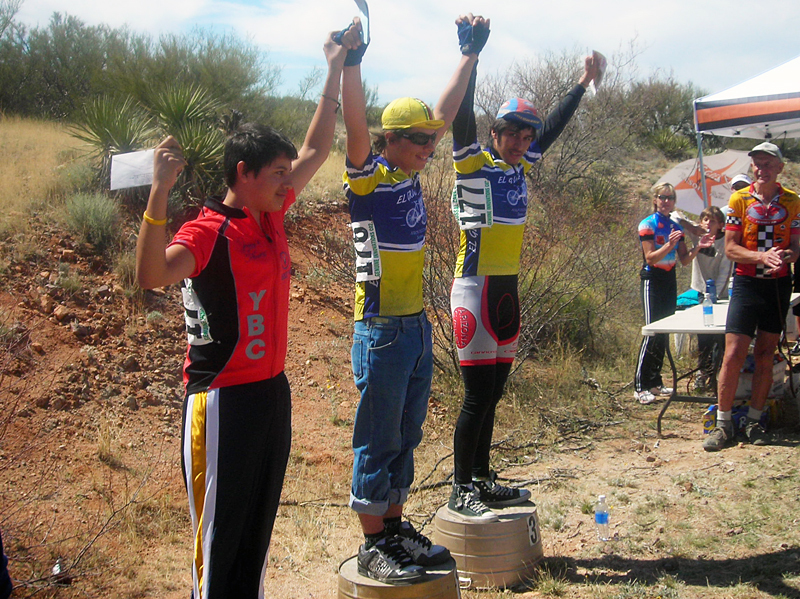 "In their debut race of the 2010 season against some of the stiffest competition seen in the junior divisions in years the kids from Yuma have shown their true character! 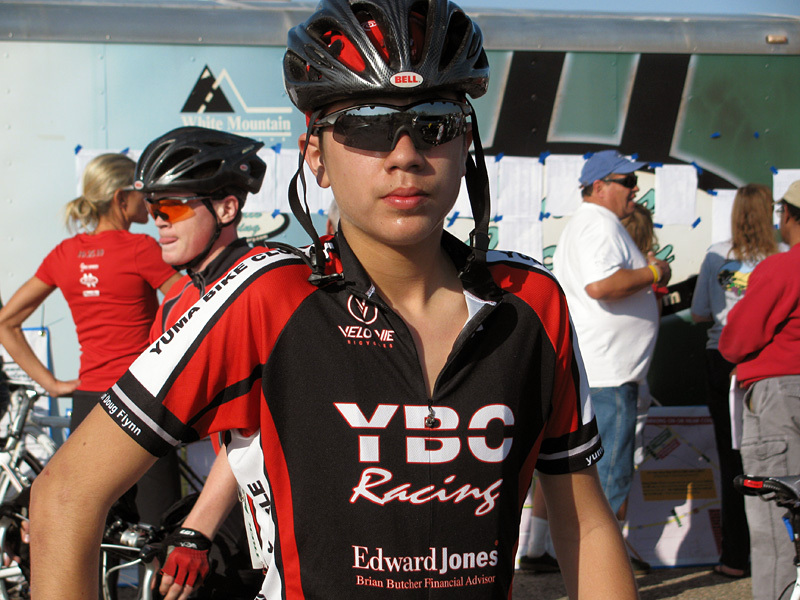 In a field of some 30+ riders spanning ages 10-18 the YBC Racing Team brought home three 1st place finishes, two 3rd place finishes, and a 4th place finish. It was a bitterly cold morning. The kids met at the school at 3am on a Sunday to make the long drive to Avondale. When we got there it was so cold that the parts on the trainers had to be warmed up to work properly. 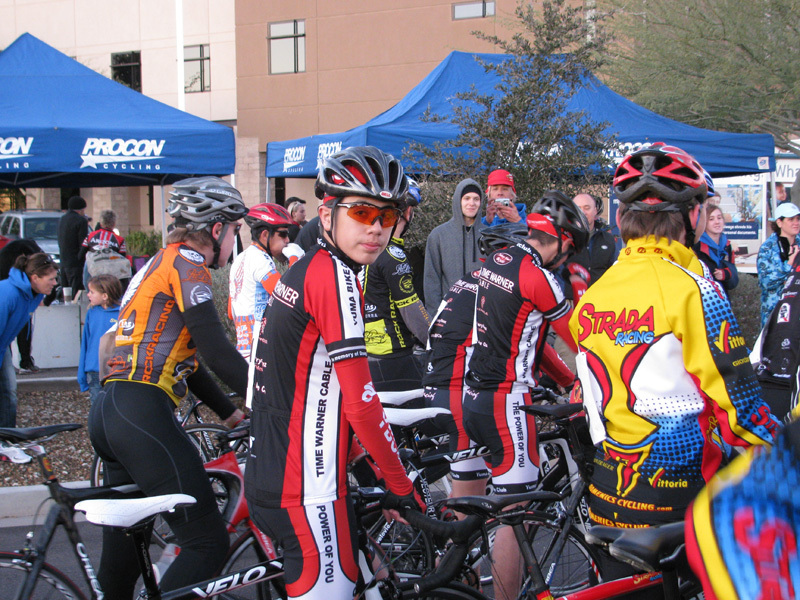 Team Strada was there in force as well as Trek Landis and the other teams from Phoenix. It was the largest junior field seen in the past two years and the riders took their place nervously at the start for what promised to be a fast course. With the lead group averaging 24 mph and hitting top speeds of 34 mph the racers were gasping in the cold air that seared their lungs as the tears streamed past their cheeks. Fingers frozen on the bars the riders jockied for position. In a spectacular nine rider-across sprint for the finish! 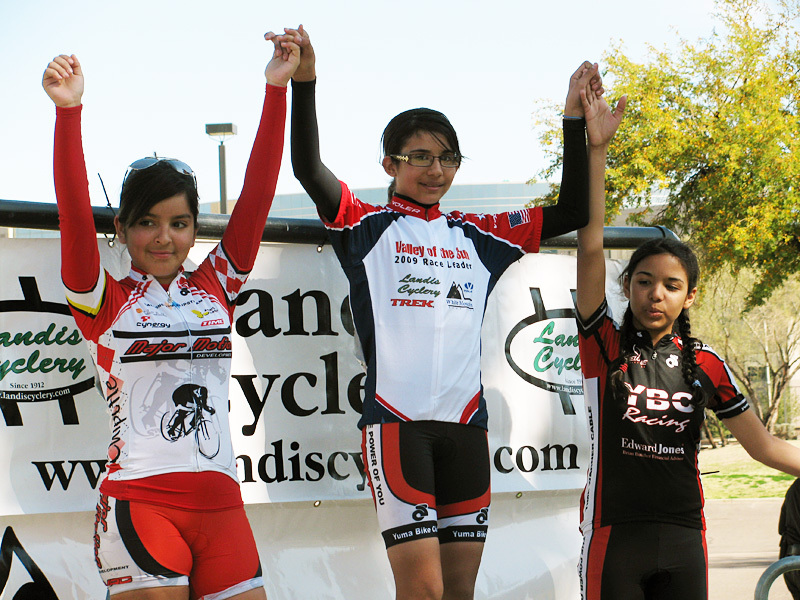 Andrea Garcia-Brown beat several of the boys to clinch the first place win for the 13-14 yeaar old Jr Women. 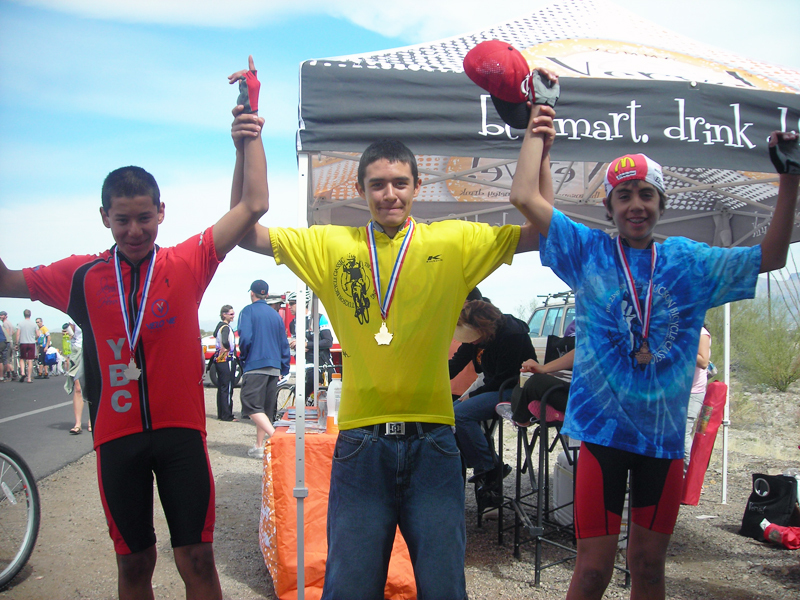 Genaro Diaz clinched the win for the 17-18 year old boys, and in his very first race ever Joshua Hansen won the 13-14 year old division. 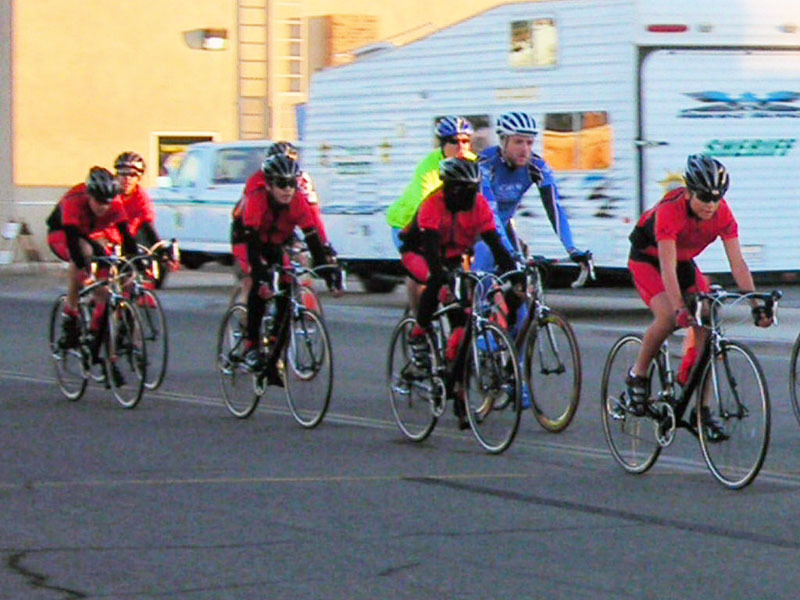 Several of the boys also competed in the men's cat5 race in a field of 50 riders. Juan Arellano made an exciting move from the rear of the peloton to the front to win a sprint bonus on the next to last lap but couldn't hold the lead and finished a respectable 12th place. All in all the first race of the season has shown that the team is ready to defend their five state championships. They have put in countless hours of training and have sacraficed their free time in order to train and dedicate themselves to accomplishing something great. 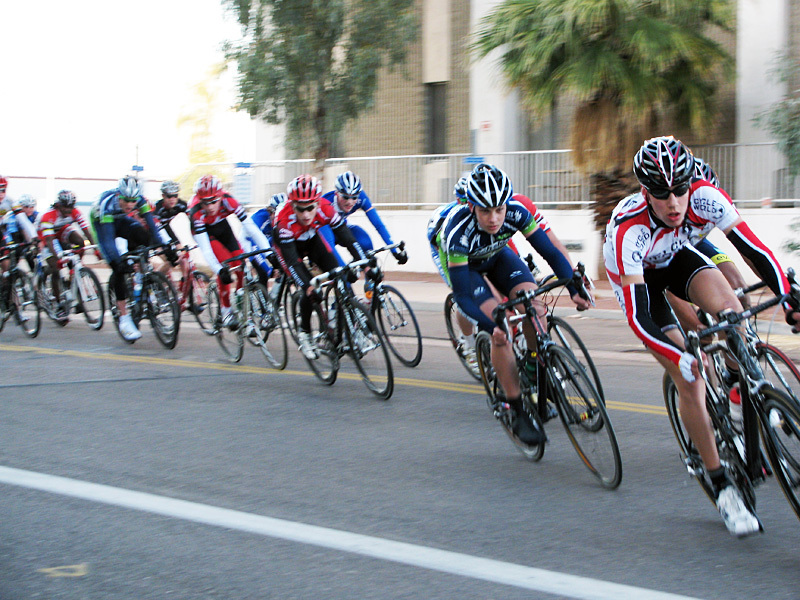 Next weekend we will be taking 17 riders to the UofA Criterium in Tucson. In addition to our junior boys and cat 5 squads our new junior girls team will make their debut lead by three-time state champion Syria Zepeda. "Just a quick outline for the upcoming "Run for the Boarder" charity event we have scheduled for this November 7th. 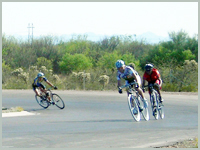 We are looking to obtain permission from ADOT for the use of the new area service Hwy. 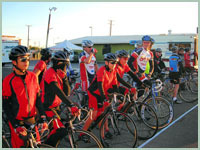 We would like to start and finish the 50 mile event in the city of San Luis. 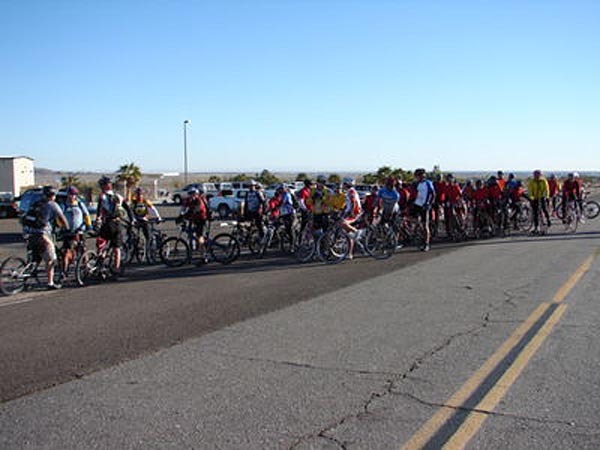 We should attract at least 200 local riders and since we are posting the event on 3 national biking calendars we hope to attract out of town riders as well. We would like to keep our overhead for the event low and are looking for vendors to handle and sell food and offer prizes. (This would also be a great chance to get your company information out to a very good market demographic) We are also looking into bring in some large bike vendors such as Shimano and others to promote their wares. We are looking for an area to set up team pit areas and vendors to set up booths. Any suggestions would be helpfull. By placing this even two weeks prior to El Tour and one week before the State Time Trial Championships we hope to draw race teams as well as individuals as a warm up event. We may also need a host hotel for out of town riders. We are actively seeking event sponsors! 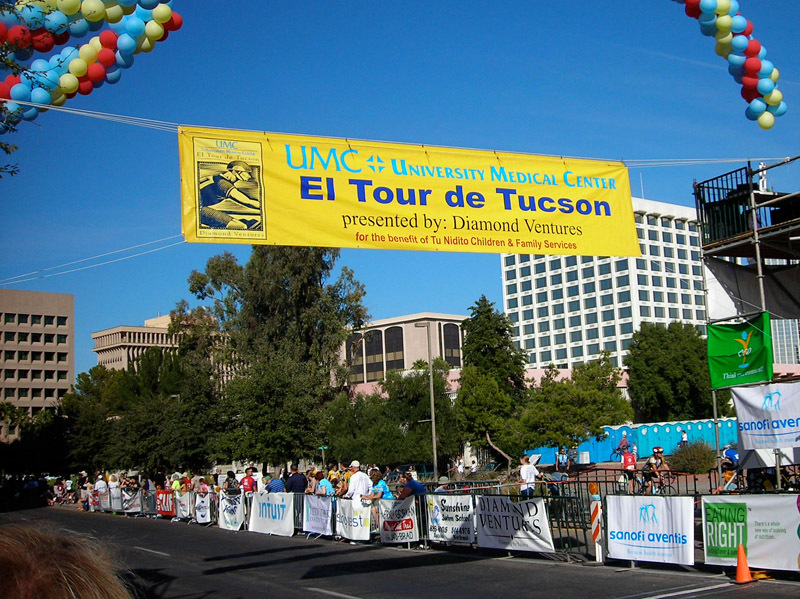 In 1991 El Tour started with 199 local cyclists. Today the event draws almost 9,000 cyclist from all over the world and generates 26 million dollars in revenue! The key to an event like this is good advertising and a fun experience for all participants. As an event liability will be handled through USA Cycling as part of the registration and this will include any event volunteers. And finally we need to get the word out to our local communities! Besides the 50 mile speed course we will also be offering a shorter 25 mile course with feed zones and safety/support vehicles. All people are welcome and the cost to register is $40 per adult and $20 for minor child." 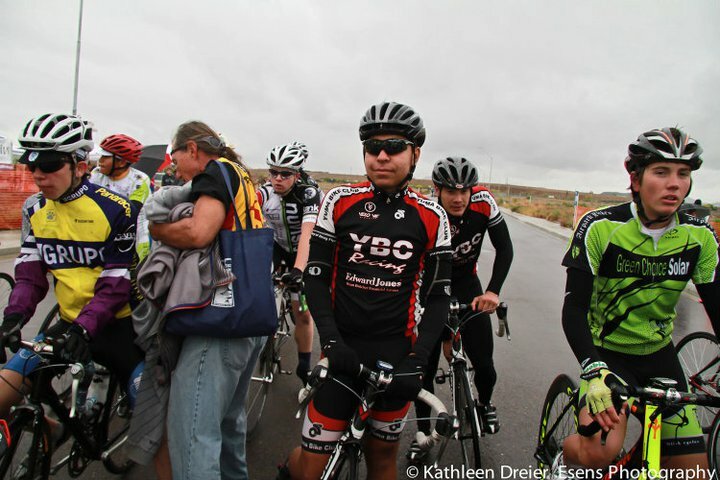 "Last weekend I learned a lesson in courage from one of my riders. It was a classic sports story, one of those tales that make you admire what the human spirit can accomplish. 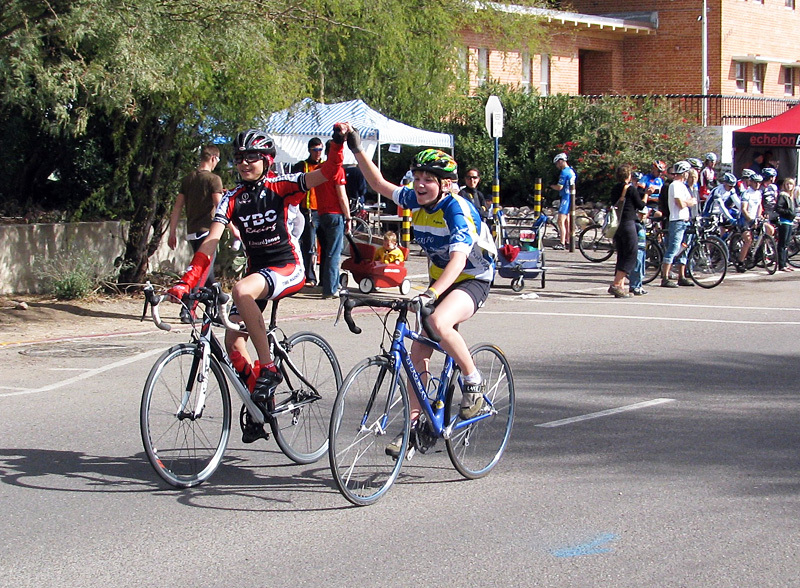 Last weekend our team competed in the state road championships. For the juniors it was a gruelling 42 mile mountain course made up of climbs of over 7% grade and screaming descents at speeds that should never be attempted on a bicycle. I was following one of the riders downhill and the speddometer never fell below 42 mph! 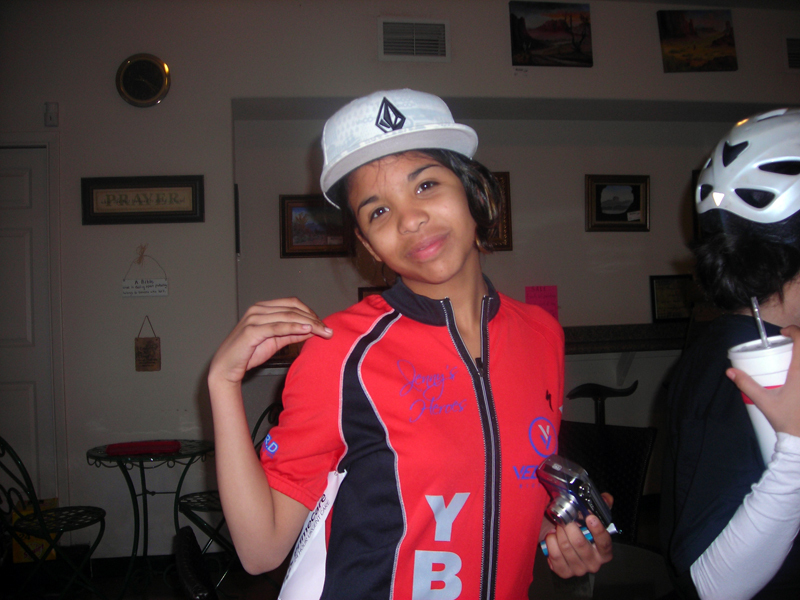 The night before we stayed with the Salvation Army, while the big teams slept in their hotels or tour vans. 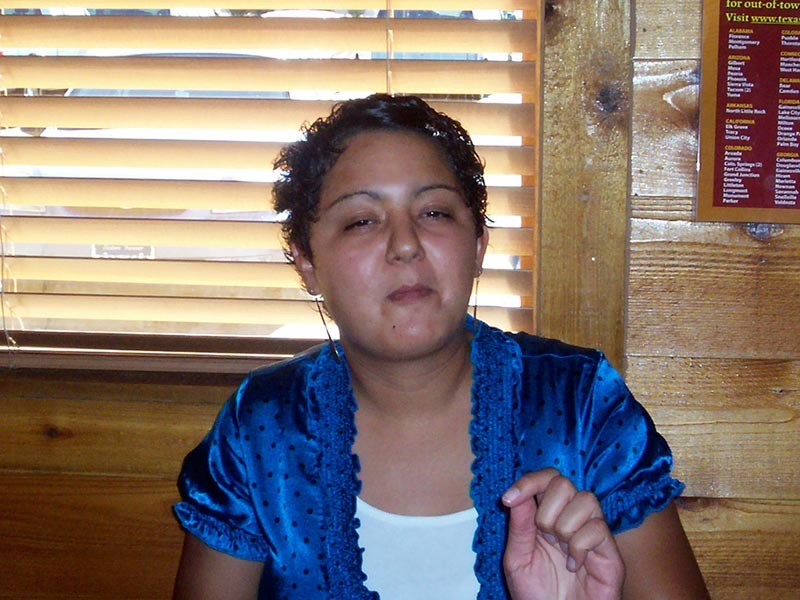 Andi Garcia-Brown, was running on the sidewalk when she twisted and fell stubbing her toe. She got up laughing and I didn't give it much thought. I checked for swelling and it was normal, tender, but didn't seem broken...I was wrong! Andi had broken her toe in a twisting fracture. In the process the ligament had wrapped itself around the bone. 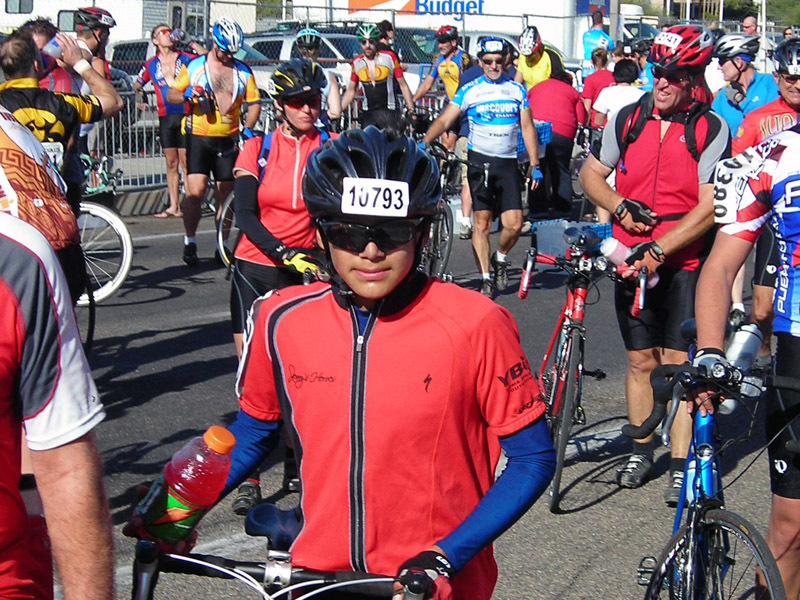 The next day her foot was sore but she was full of race jitters and wanted to go anyways. This was a state championship so the pace would be fast and furious. I leap-frogged between the groups with the team van. At the top of the mountain I pulled off and waited for my riders to make the turn. As Andi crested the hill I could see the tears in her eyes. I ran beside her and tried to talk her into pulling out. She was in pain and told me her foot ached. But there was no stopping this determined child! She gracefully made the turn and sped out of sight down the mountain. Broken toe and all that girl gave it everything she had! I never did catch up with her. 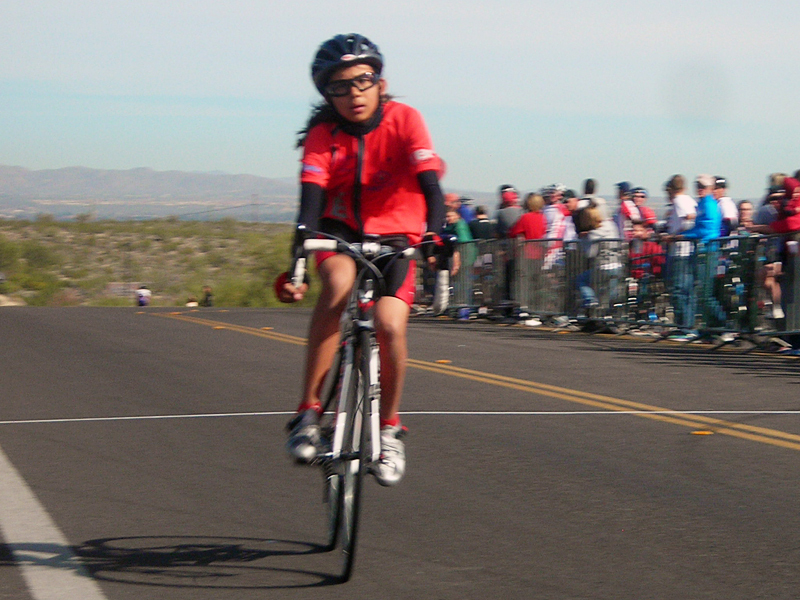 By the time I got the van turned around and followed the last junior rider she had already crossed the finish line for the silver medal, right behind her two-time, state champion team-mate Syria Zepeda. She rode wingman and doggedly held off the competition. 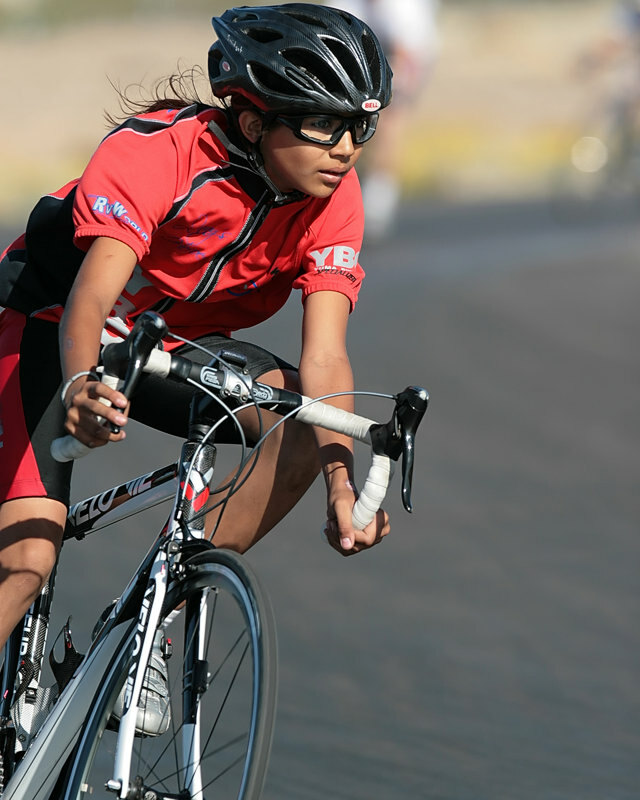 Playing the role of domestique, she rode for the team regardless of the pain. It was only later that I found out the extent of her injury. Her toe was so badly fractured that they couldn't reset it. They had to perfom surgery and cut the ligament since it was wrapped around the fractured bone. She had to have a pin placed in to hold it together. Without the ligament her toe will always flop around. But the doctors assure us she should be able to compete again. The pain must have been excruciating! Yet, she was afraid I would pull her and didn't want to leave her team-mate contending for her second championship without support. Pedal stroke after pedal stroke had to have sent shooting pains through her foot. Climbing up that steep grade had to have been and agonizing hell for her. Many adults dropped out, I would have! But she never stopped, cycled through the pain and the tears, protected her team leader and had her back all the way to the finish. Less than a few bike lengths separated the two girls. So you can have your professional sports heroes...mine is a small 13 year-old girl who showed me and the rest of the state what true courage and dedication is. She taught us that determination knows no age limits, that the competitive spirtit is strong in this young generation, that these kids have the hearts of warriors! And Andi? 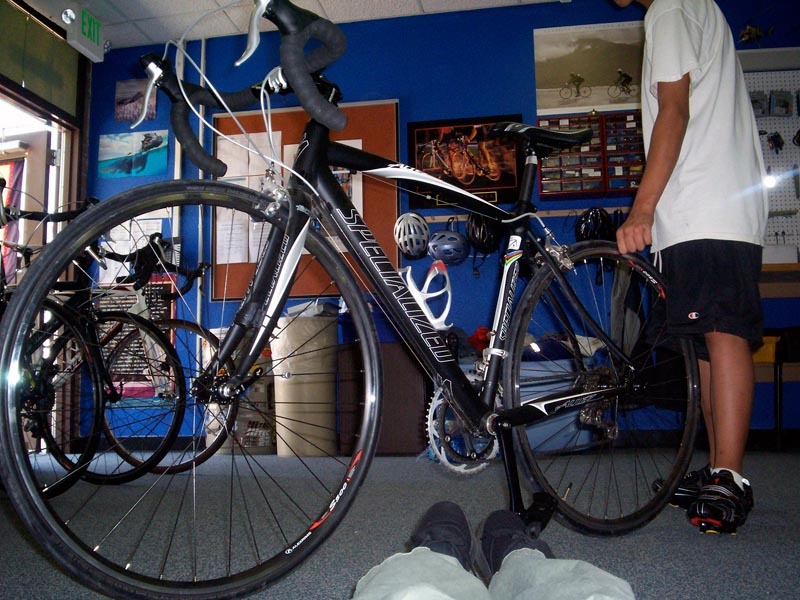 She is only worried that she will not be able to train on her new carbon-fiber bike for the next four weeks! She had her hand held in surgery by her team-mate, Jessamy, who came all the way from Somerton to be with her so she would have a team-mate there by her side as they put her to sleep. I am honored to have been able to coach these kids. They are so much better than me that I cannot even find the words to express my emotions!" "On a course that would break a strong man...those plucky Yuma kids did it again! The State Road Championships was a tough course to say the least. A long climb at 4-6% grade, only to be followed by an even longer climb at 7% grade. A 35 mile course that was actually 43 miles, and a good turn out of quality competitors. They were all there DNA Racing, our favorites El Grupo, Tribe Racing, Landis Trek, Strada, Thunder Mountain, the powerhouse team of Waste Management, and of course YBC Racing. 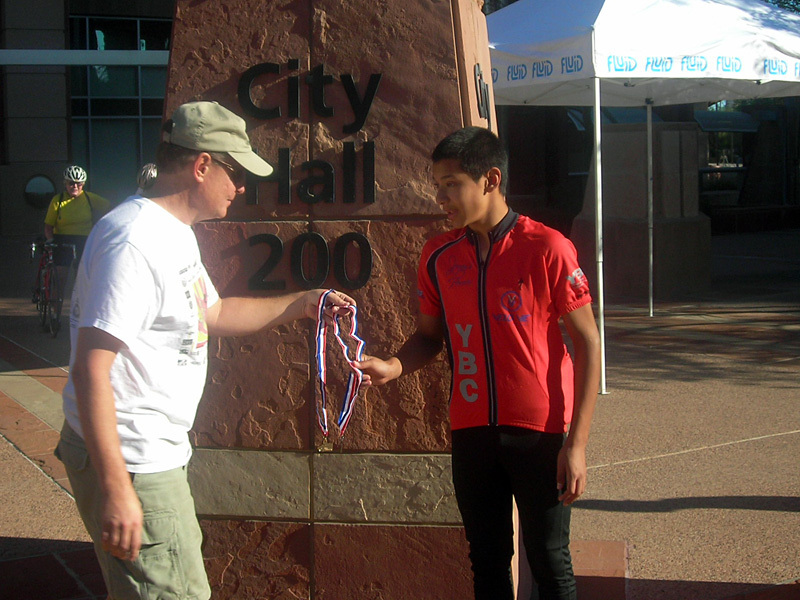 The Yuma kids managed another Championship for Syria Zepeda, Andi Garcia brought home a silver medal, and Primo Yocupicio pulled in a bronze medal. Team DNA pulled in a great finish as well as EL Grupo and Strada. Even though they were staged 2 minutes behind the cat4 women and 5 minutes behind the cat5 men, juniors pulled ahead and beat both groups! The course alternated between strenous climbs and descents that would test the nerve of the best rider. Average speed off some of the computers approched 50 mph! It was a great race with perfect conditions...all of the juniors finished their races and were a credit to our state. leading all 4 junior divisions for Copper Cup Points!" "As the season winds to a close I wish to personally thank everyone who helped make this year a reality. These kids have accomplished great things! They have won 23 races, taken the podium 55 times, and secured a state championship. 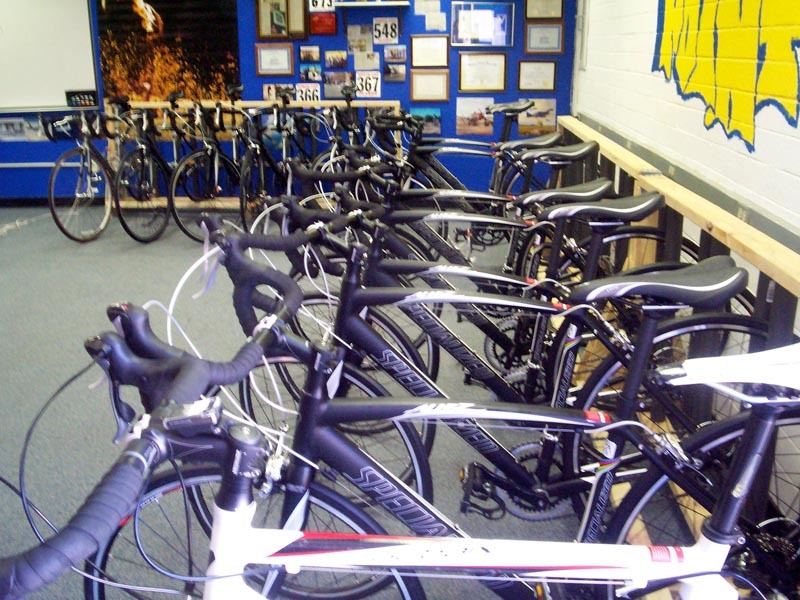 * We fixed up 13 bikes for the Christmas bike drive to be donated to needy children. 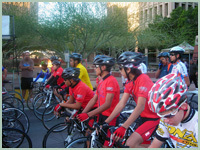 * We donated shoes, clothing and equipment, including 8 road bikes to a needy intervention team in Tucson. * Currently the club is working with Crane district to secure a $50,000. 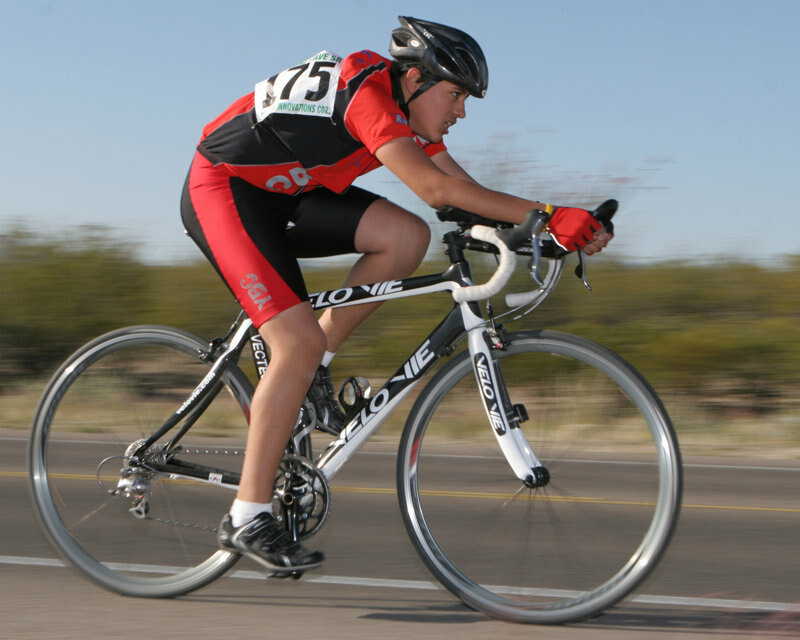 grant to help provide exercise equipment and training to obese children in Yuma county. This little club is having a big impact upon our community and we could not have done it without your support! As we finish this season we are already looking to next year: holding tryouts and expanding the team, purchasing new uniforms (they have already worn out the old ones! ), and racing an even larger schedule next year. 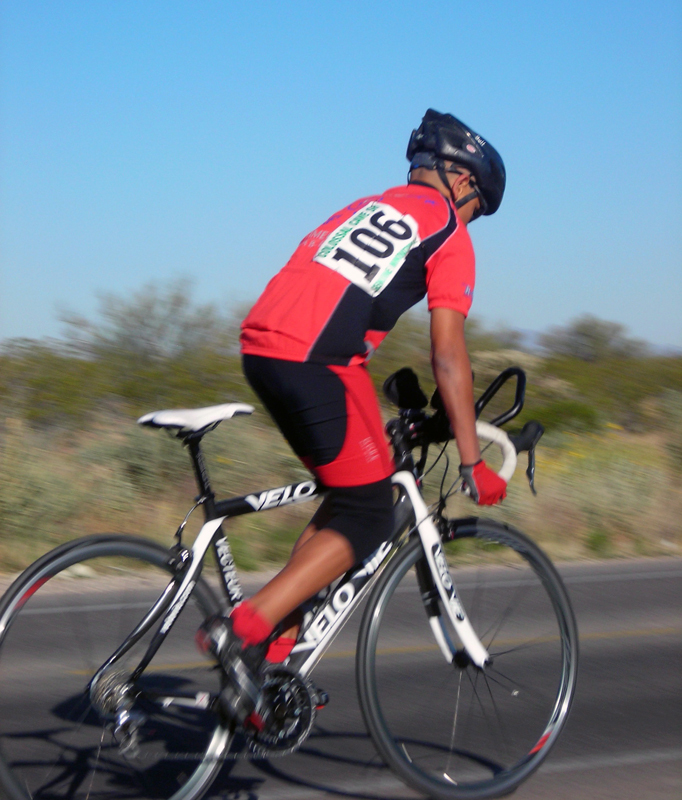 John sent us an update along with some great action shots of the individual cyclists racing... "The season is winding down, we are doing insane hill climbing practices for a championship we do not need but the kids want to race in the sweltering heat of an Arizona May-June. These kids amaze me! They rise to any challenge and look for more! When I reflect upon all the races, the practices, the meals, and hotels; the long car trips and early mornings, I wonder, "what have I gotten myself into?" They race for the same reason rich white men climb mountains, to test themselves, to prove something, to be part of a great endevour. I know I have said before how proud I am of these kids, but that seems shallow and hollow. 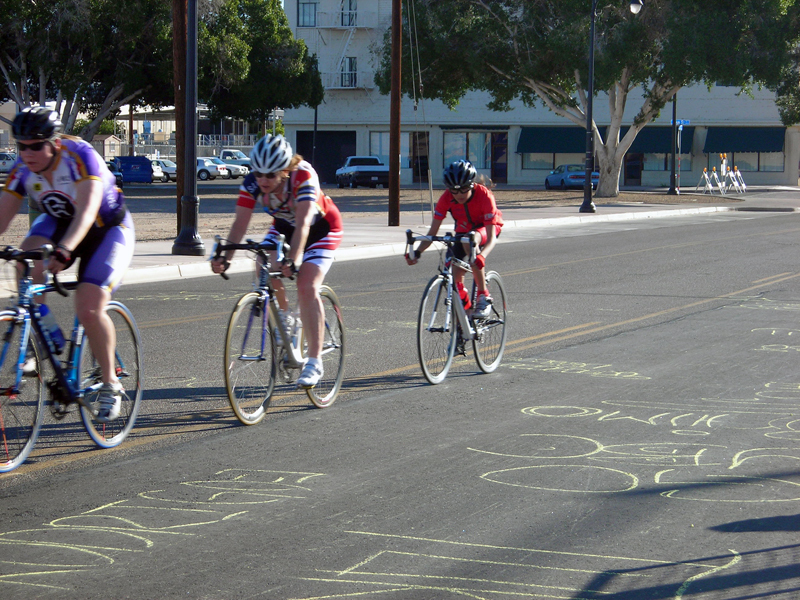 I admire these fierce competitors, these cyclists and their poetry on the bike. When they ride their is a grace that words cannot describe. They are not part of something great...they are great! Again, thank you Jenny for making it all happen. I hope you like the latest photos, they were taken by acclaimed sports photographer Mason Ibas. John sent us a kind note... "Through your generosity we have been able to compete in almost every major race in Arizona this season. The result? 52 podium finishes, 22 wins, a state champion and we are the #1 ranked team in Arizona and leading the Copper Cup standing in three out of four divisions! These kids are fantastic, they race with their hearts and give it all and the results prove it. We have raced against bigger, better funded teams: Strada, Waste Management, El Grupo, Tribe Racing and we have emerged victorious! 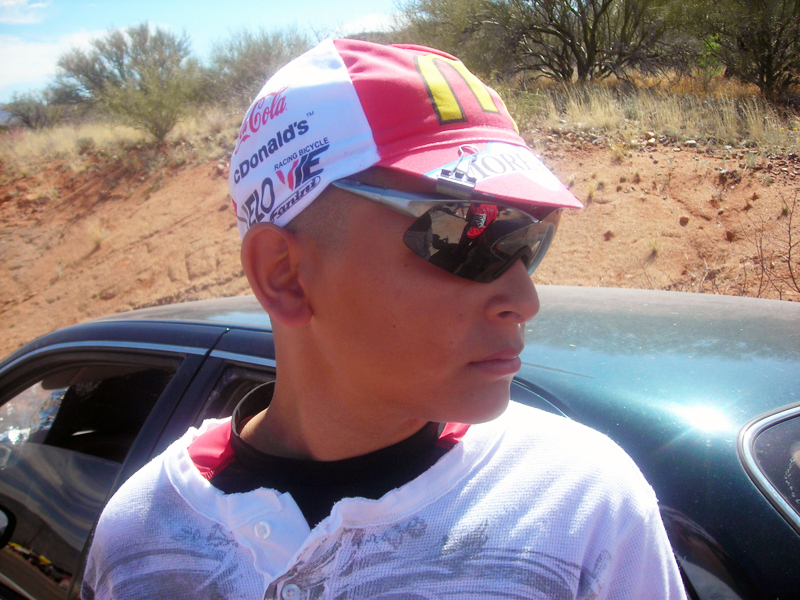 It is our goal to have a Yuma kid racing in nationals within two years and I am confident with the continued support of folks like you we can achieve that goal! With only two races left in the season I wanted to say thank you for making this possible." 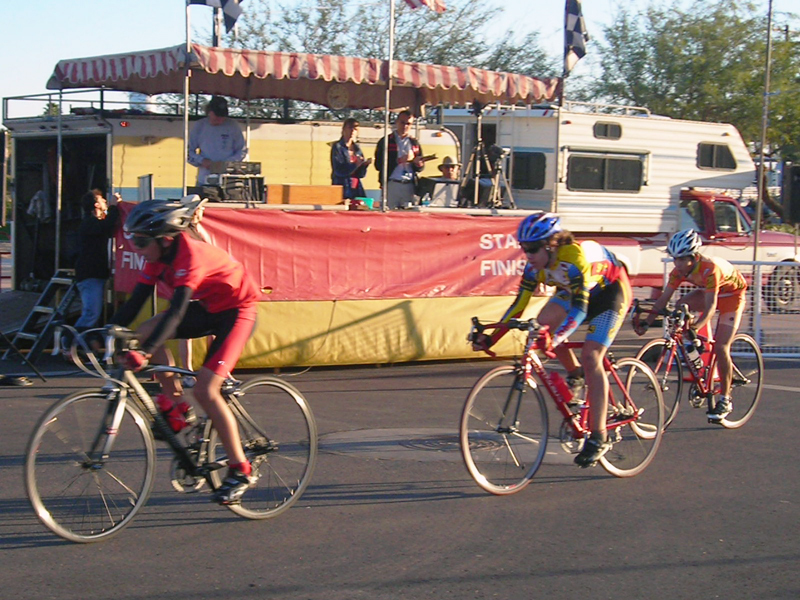 John was excited to report the results of Arizona State Championship Crit over the weekend... "We have a new Arizona State Champion! And it is Syria Zepeda! 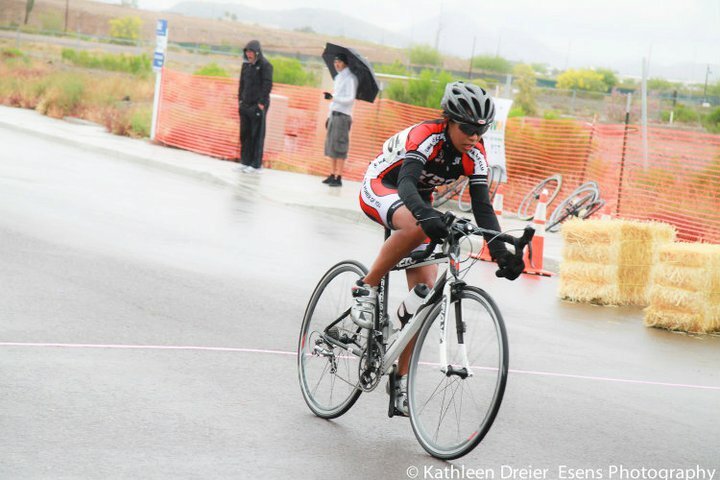 After a perfect season she clinched the Arizona state crit. Championships with ease. She is also the top ramned junior girl in the Copper Cup series. 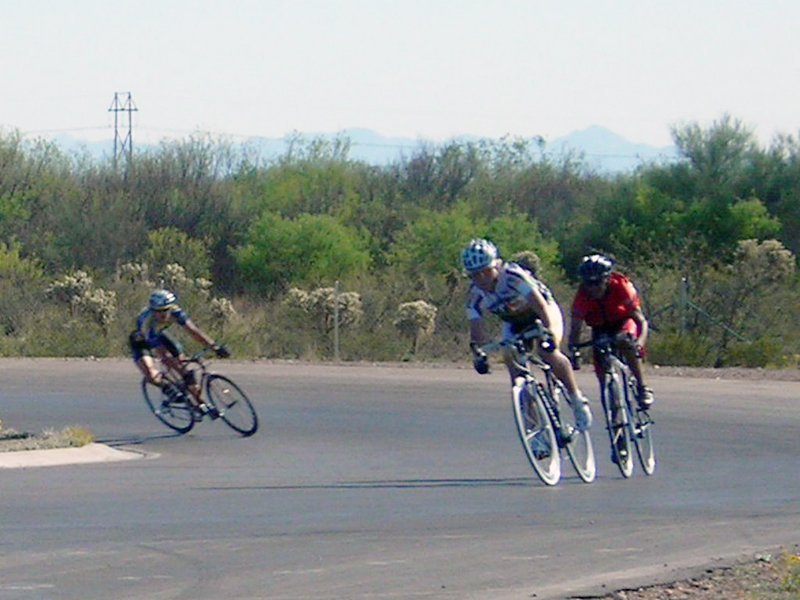 Rodrigo Diaz beat back some tough competition from Strada, El Grupo, Waste Management, and San Tan teams to clinch 2nd place, silver medal, then went out again to place 8th in the men's cat-5's. Alex Veiyra, pulled off a beautiful slingshot move to position Rodrigo for the final sprint and ended up taking home 4th place. Primo brought home the silver for the 17-18's. 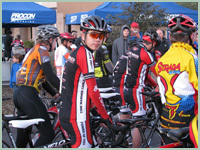 All in all we have 6 riders in the top rankings for the Arizona Copper Cup, and are leading 3 out of four divisions!! 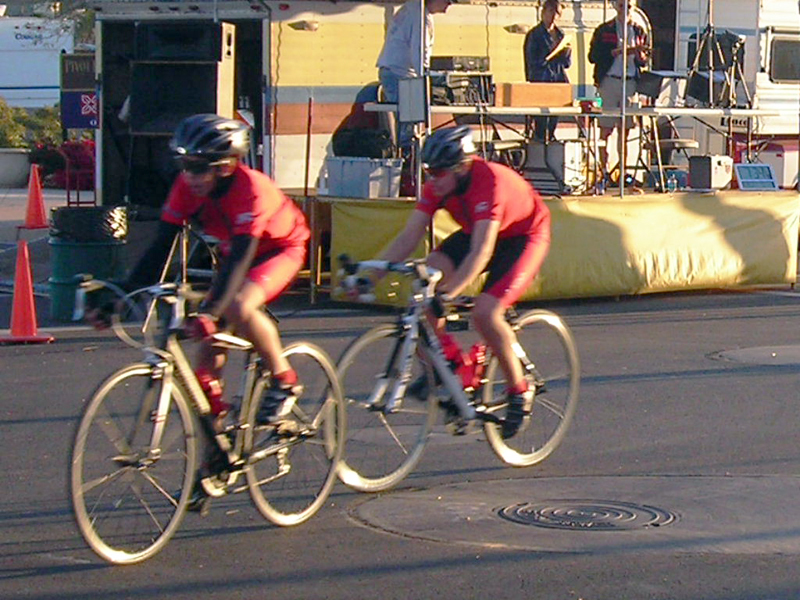 Then the boys raced in the men's cat-5 for the experience. What a race that turned out to be! Nervous they held at the back of the pack for the first several laps. Then Jesse mounted a charge that got him to the middle of the pack. Tom was stuck out front and Rodrigo rode to his rescue. Moving up the pack he gained the front. Although, Jeff rode brilliantly up to pull for Tom it was too late, he was spent and had pulled to long. 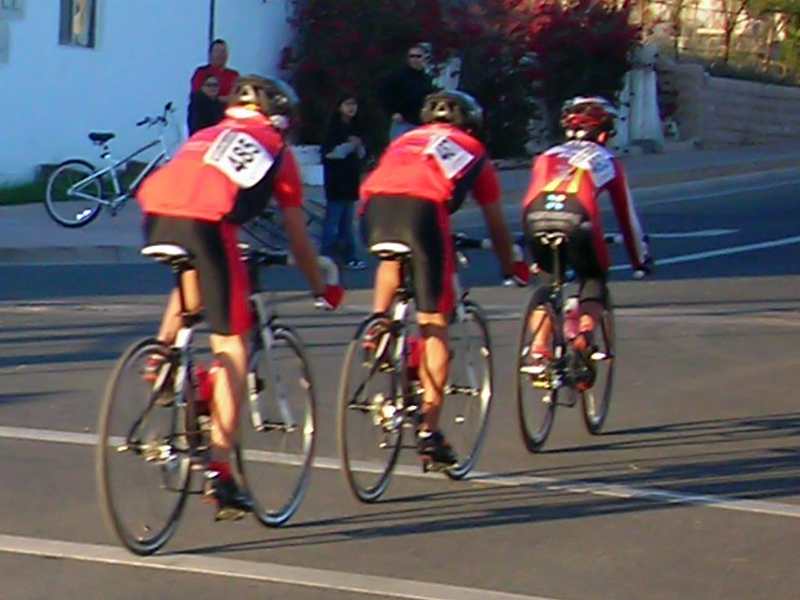 There Rodrigo held in the front group for the last third of the race by himself. They could not shake him from the number four spot. Turn after turn these men strained to shake the silly kid with a shark grin, but to no avail. Around the 180 degree turn, down the straightaway into a series of 90 degree turns, the speed inching up to 30 mph. 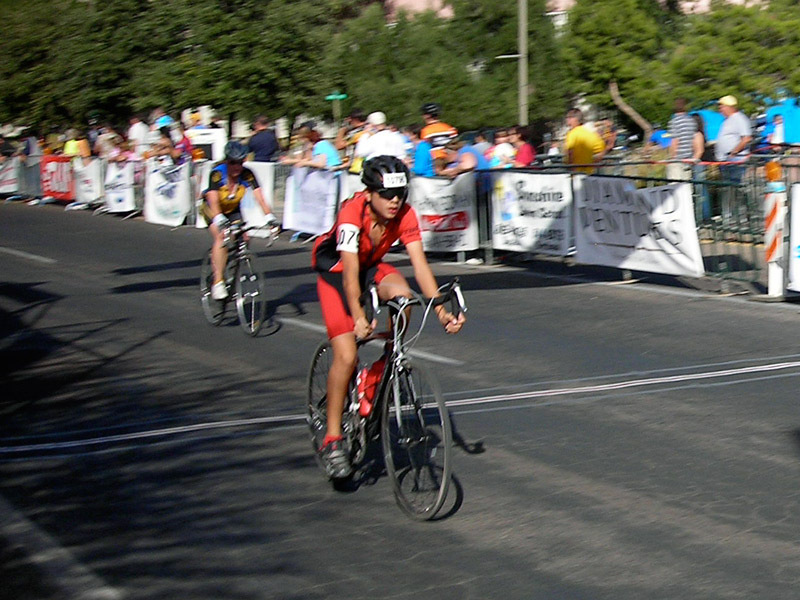 Spread out in the final sprint, jostling and jockying for position, all alone, the nervous kid from Yuma in his first cat-5 crit, in the championships pulled off an 8th place finish that set the crowd wild. Thank you Tom and Jeff for taking these young riders under your wing and mentoring them. See you at the state road championships in June! YBC is definetly a presence on the Arizona Circuit. They all know who we are now!!" 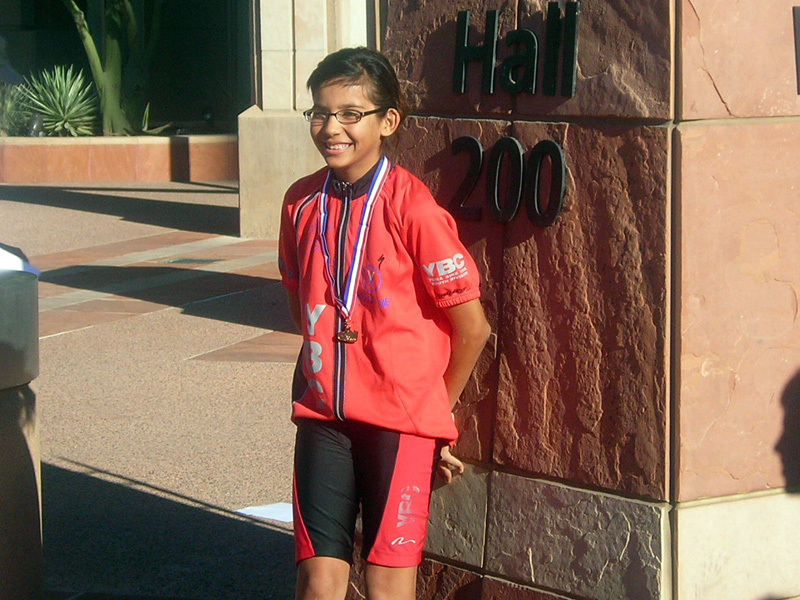 John emailed us the results of last weekend's U of A race... "Well, we just got back from a series of road races and the kids did great as usual! We took 1st, 2nd, 3rd in the junior boys ages 15-16. We also took home 1st, 2nd, 3rd, in Junior girls ages 12-14. 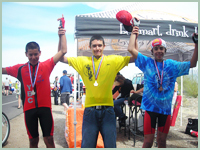 We took 1st and 2nd in boys ages 17-18, and a 1st & 3rd in boys ages 12-14. Overall we are the number one ranked team in Arizona and we are leading in 3 out of 4 divisions we race in this year!" 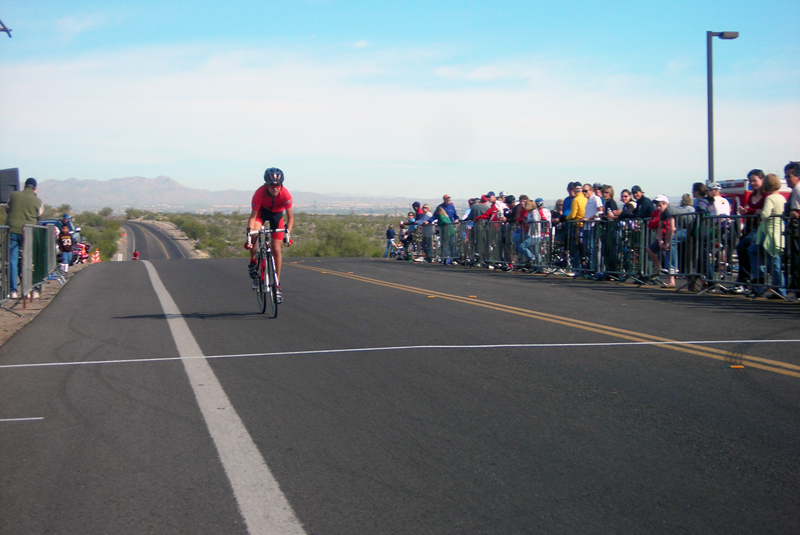 The team raced in the Colossal Cave Stage Race over the weekend. Here's the report from John... "Well, it was a great weekend! 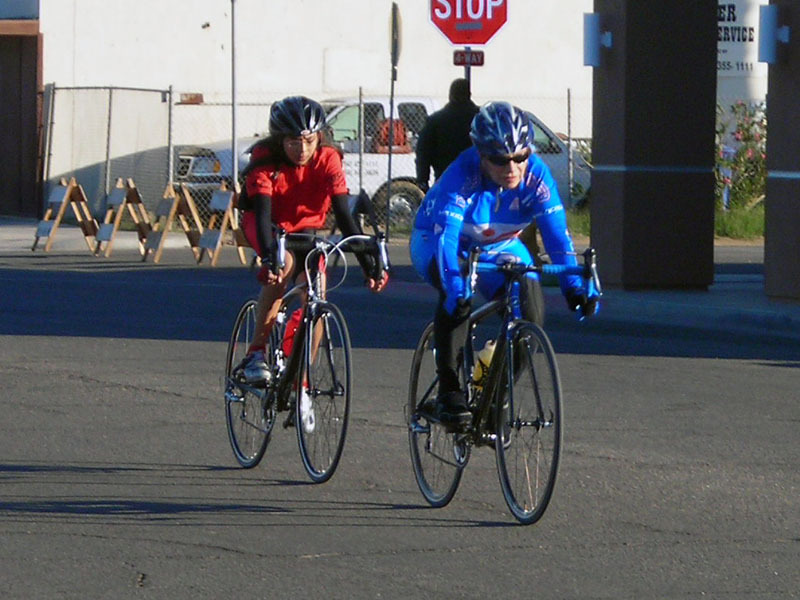 The weather was good, a bit cold for the time trial, but warmed up nicely for the crit. 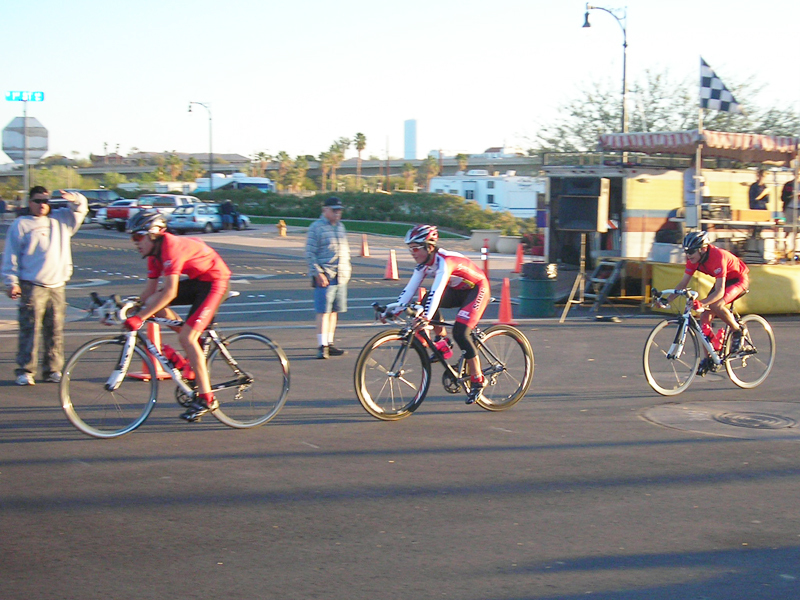 Speaking of which the crit course was very challenging with several bad spills. The kids did well, overall we won one 1st place and GC win, two 2nd places finishes, and a 3rd place finish. Rodrigo placed second in his division all three days against the Waste Management team, and Walter placed third in his division against some strong competetion from El Grupo. Primo took home two second place finishes and a third on the road race. Little Syria was once again the big winner taking home first place all three days in her division!" 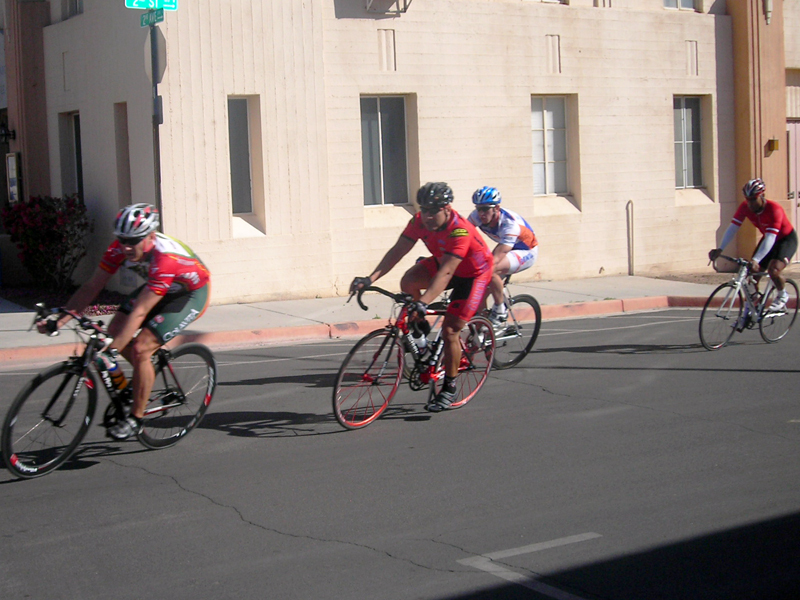 John sent us a report on last Saturday's race... "The Tour de Yuma was a great success! 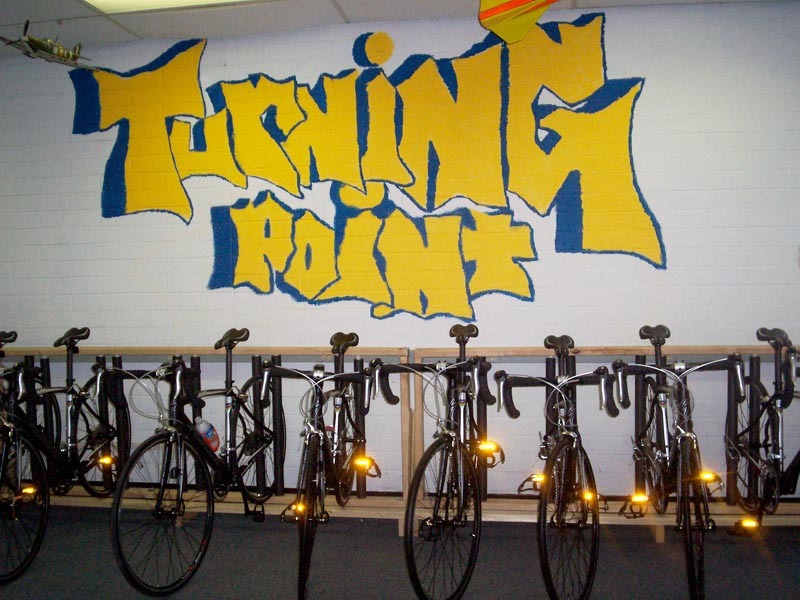 Together, the local cycling community and our sponsors raised over $5,000.00 for the Turning Point kids. This will allow us to complete our 2009 race season. 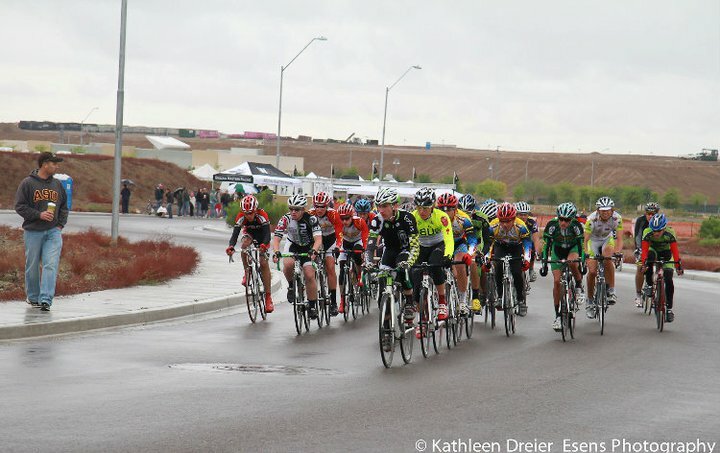 The weather was perfect and many riders set a fast pace. 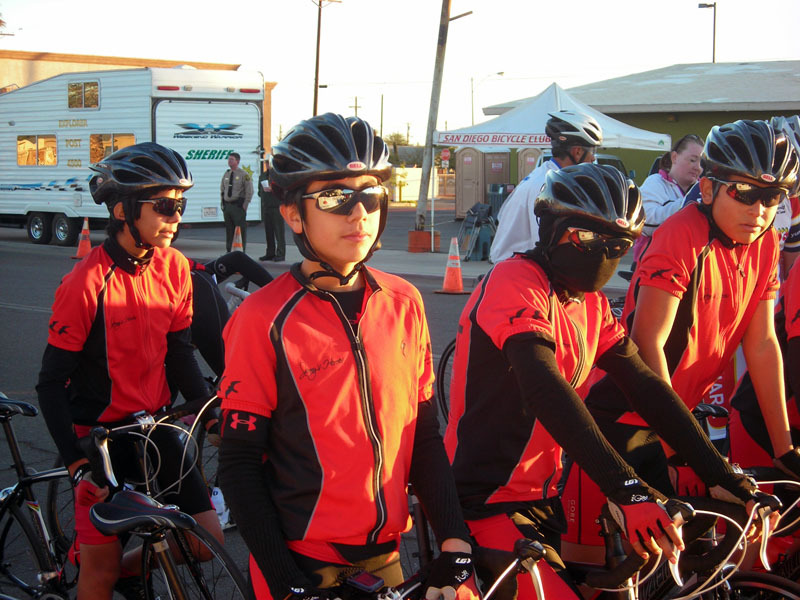 The Turning Point team in their matching red and black uniforms lead the way and everyone commented about what good kids and riders they were." 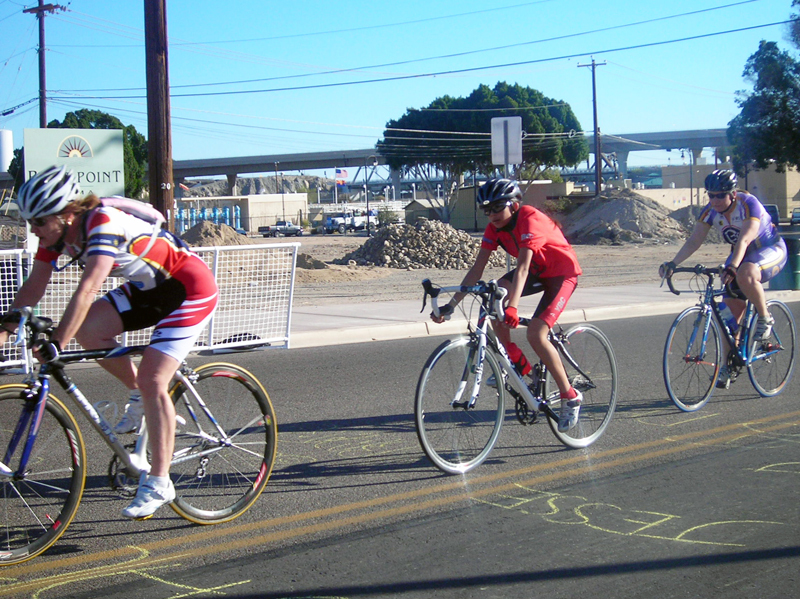 This Saturday, March 21st, is the 5th Annual Tour de Yuma. 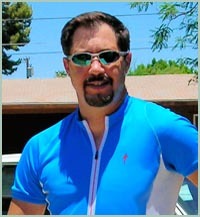 John describes the race as follows... "The ride begins and ends at Gateway Park in downtown Yuma. The ride is a grueling test of stamina and willpower. Show up to see how you measure up to the rest of Yuma's finest athletes." 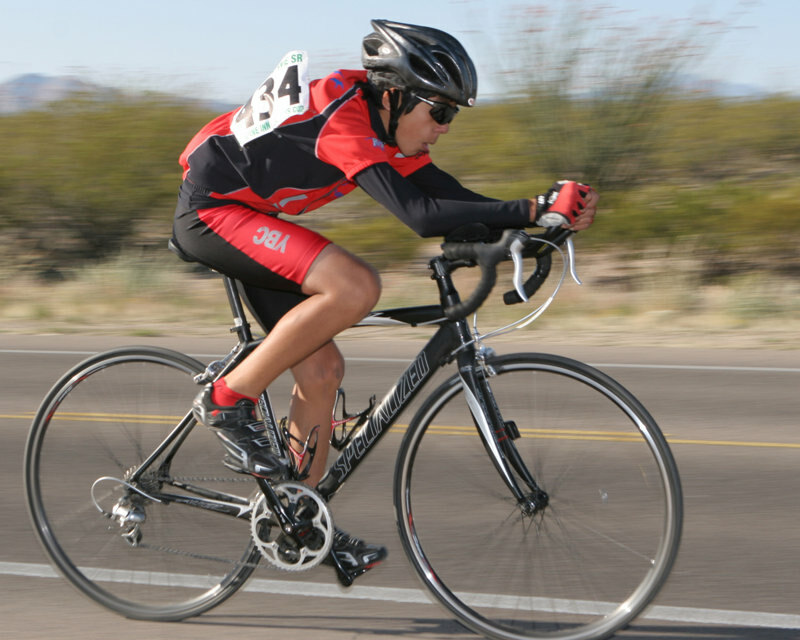 We heard from John about their recent participation in the Tucson Bicycle Classic. The team continues to make us proud. "Our kids did great! 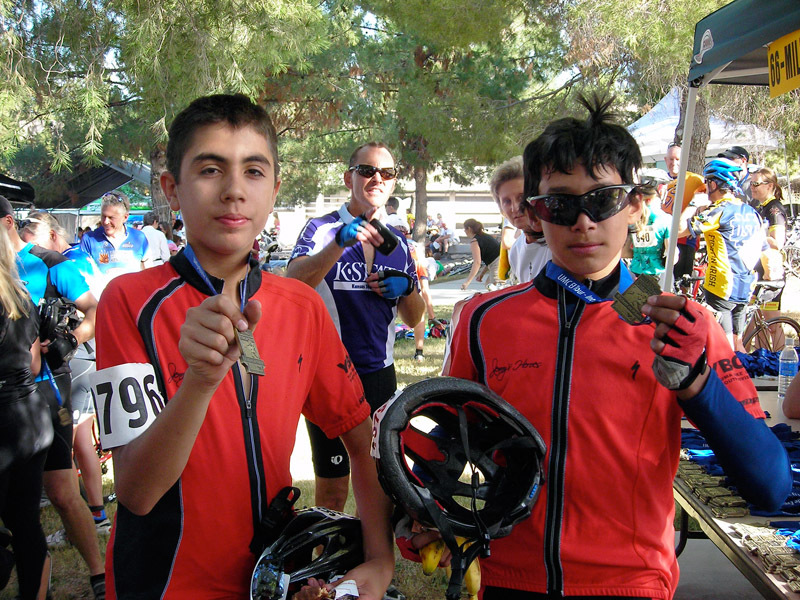 They dominated the field in their first junior olympics, 3-day stage race. 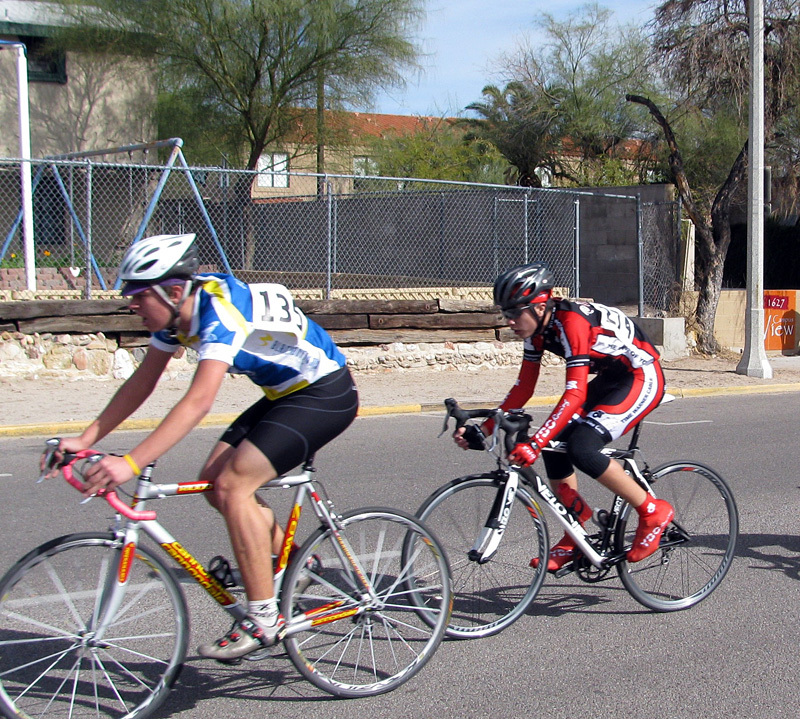 The team took home two gold medals, a silver medal, two bronze medals and six yellow leaders jerseys. Combined they won 8 of the 12 stages they raced in! Everyone commented on how professional and what good sports the team in red and black was. We also met another team of intervention kids riding old bikes that they had rescued and fixed up. 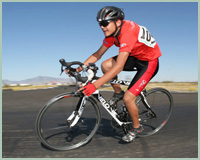 We will be sending them eight of our bikes from last year to help give them a leg up as well as additional equipment." "It was a great two day race! Turning Point kids dominated and did very well, you will be proud of our kids. Rodrigo Diaz and Syria Zepeda also did double duty, syria raced catIV women and pulled off a 6th place finish in the crit. 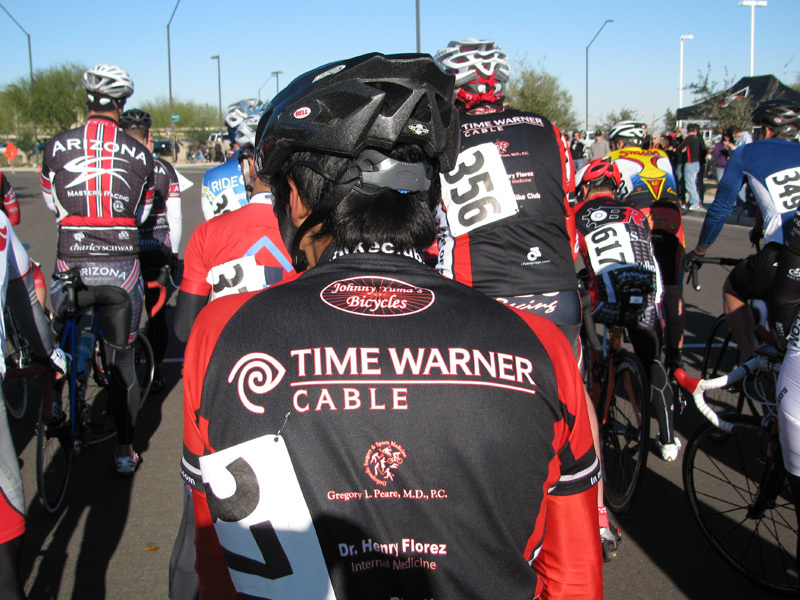 Rodrigo pulled out a 10th place finish in catV crit, and at the request of promoters was run as a catV for the road race. (He was lapping the field!) he finished 10th again out of 28 riders! For a boy of 14 to be competing at this level is unheard of." John sent us some recent training pictures and the kids are really looking great! 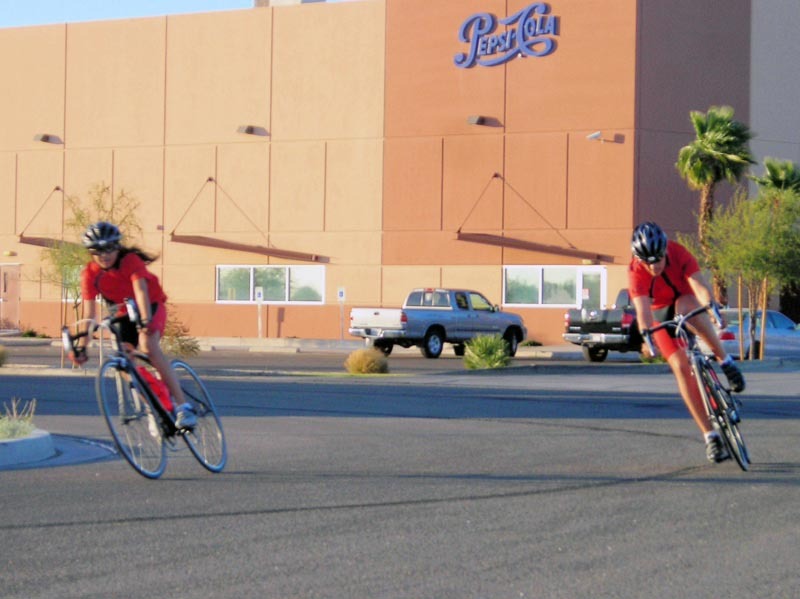 They should be making it to the state championships in both road and crit this year. 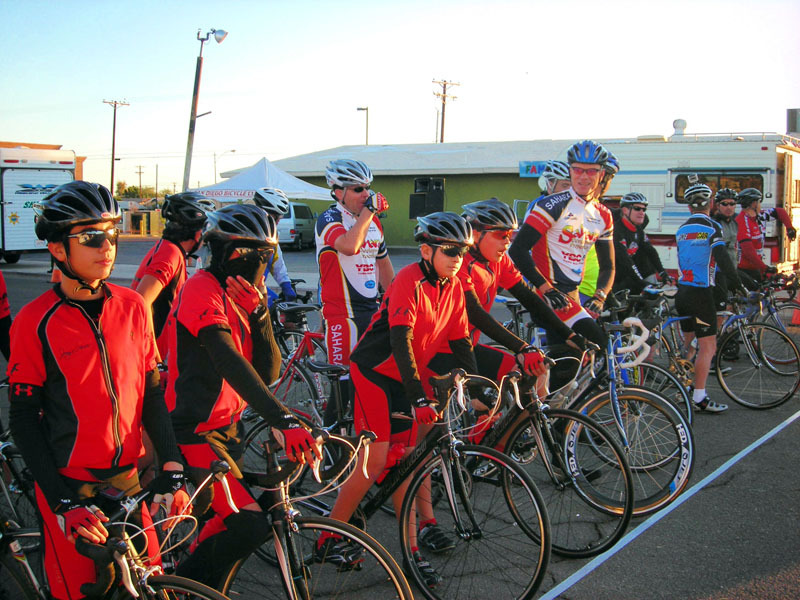 On Saturday, the team participated in the Imperial Classic in Imperial, California and John said they had a great first race. 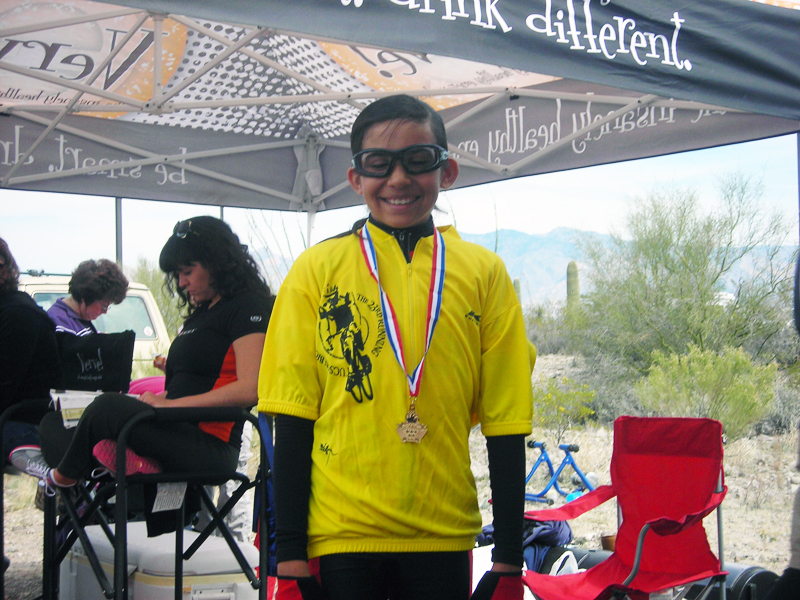 "The kids did fantastic winning first in the girl's fun race, first in the boy's fun race, 9th, 10th, and 12th in the men's cat-5 race, and 11th in the women's cat-4 race. 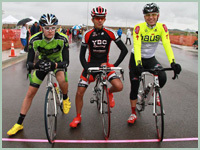 (there was no junior category; they were racing with the big dogs!) The kids are wonderful! I am so proud of them and all of the volunteers who are making this possible." We are too, John. And thanks for the fantastic photos from the race. I am so proud of John and all the kids on the team. 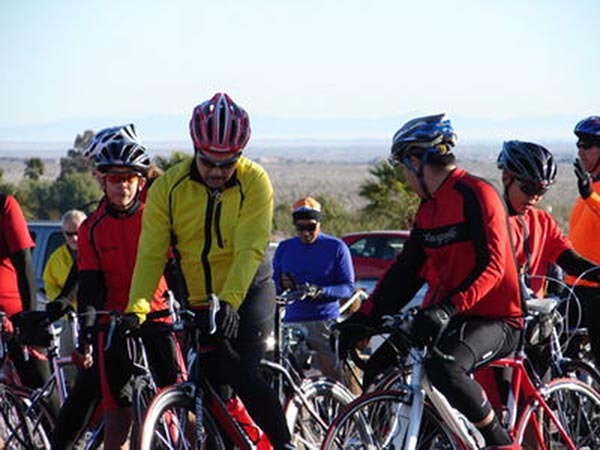 On New Years Day, they met up with the Imperial Valley Velo Club in Ocotillo, California for a challenging ride. 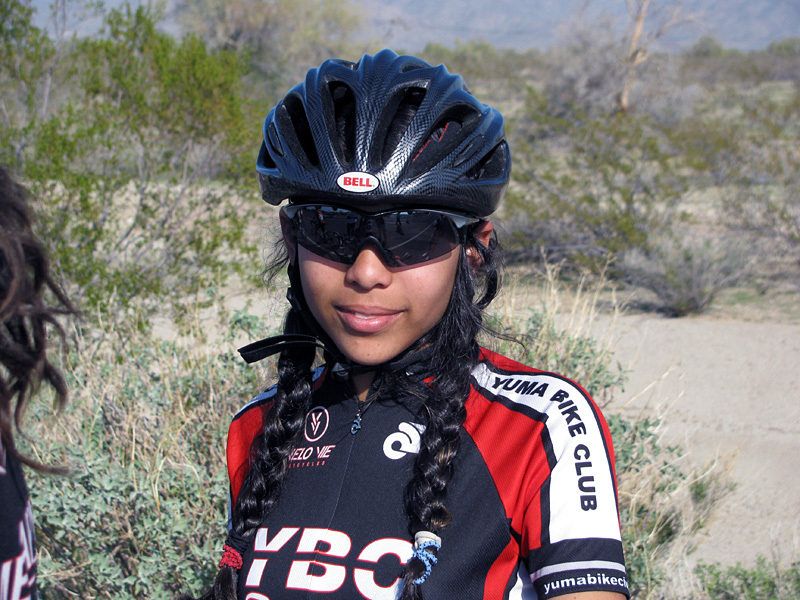 This is what Imperial Valley Velo Club posted on their website about the Youth Division: "The stars of the day were the 15 dashing young members of the Yuma Turning Point youth cycling team. 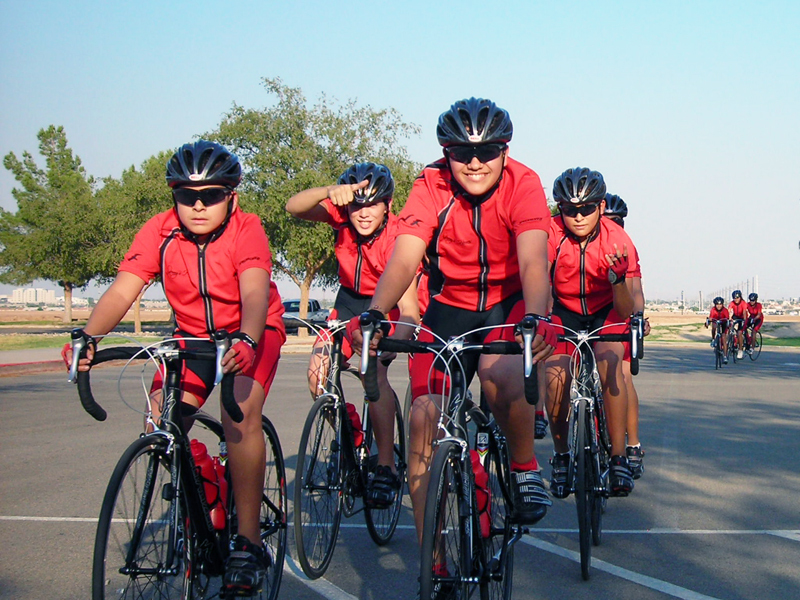 Clad in matching noble red kits and sinister black bikes, the middle school kids soon left many a veteran cyclist behind. 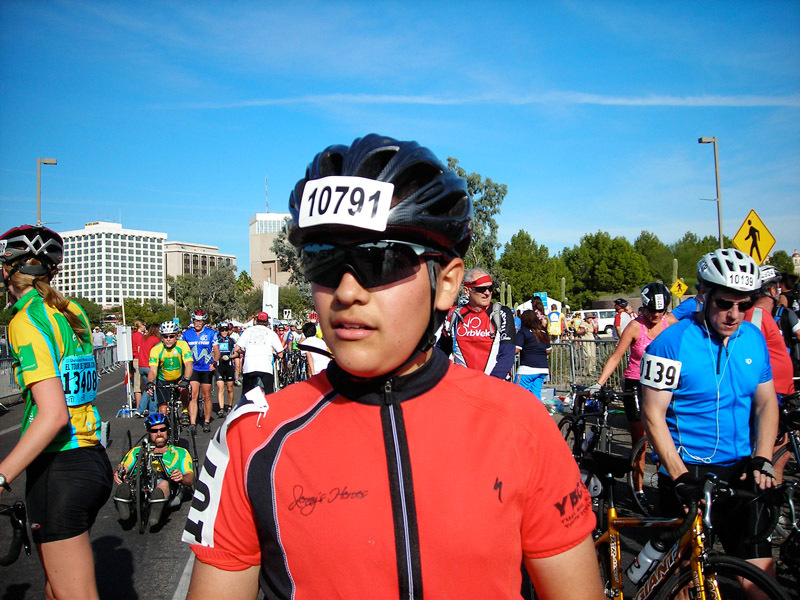 Fourteen-year old Rodrigo kept a fierce pace all the way to Agua Caliente, giving 50+ Harold plenty of motivation to keep pedaling. 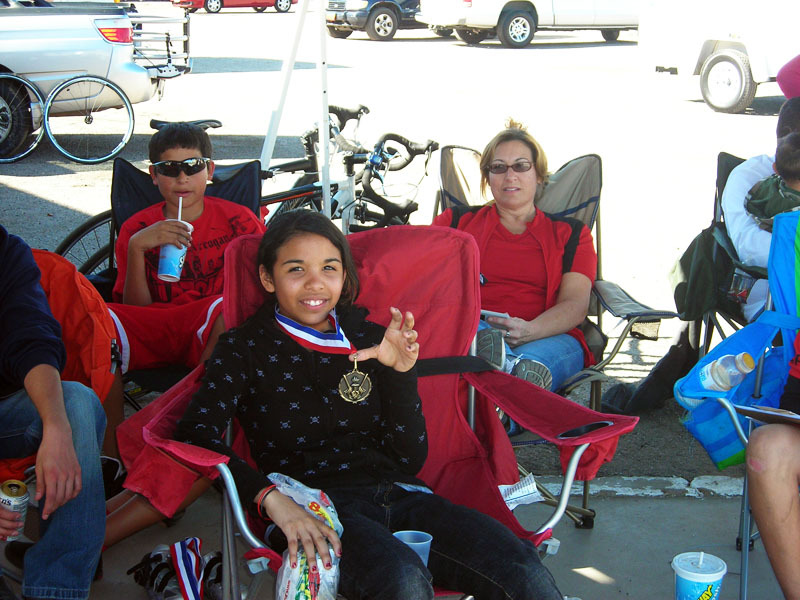 Props to John McBride, team mom Claudia, and mechanic Isaac for their great work with these young folks." This is what commitment and focus and training can accomplish. Imagine what else these kids will be able to do in life! I spoke to John yesterday and he told me how the bike club started. 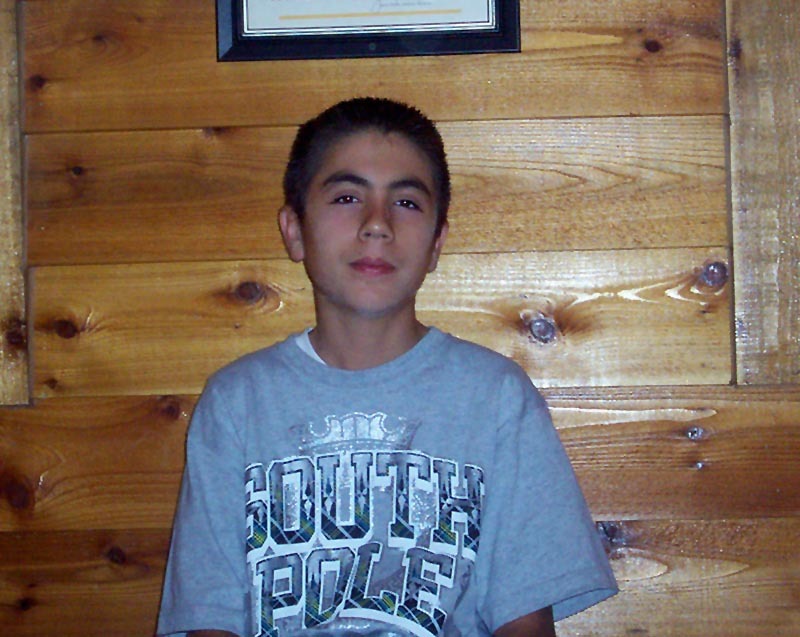 There was a 15-year-old homeless boy in the area whose father had killed his mother. The boy came to school 2 hours late one day and John chastised him for being late. The boy said he had walked for 8 miles to get to school. John felt bad for being upset but happy this this boy wanted to learn. So he decided to help and went to Target and bought the boy a bike to get to school. 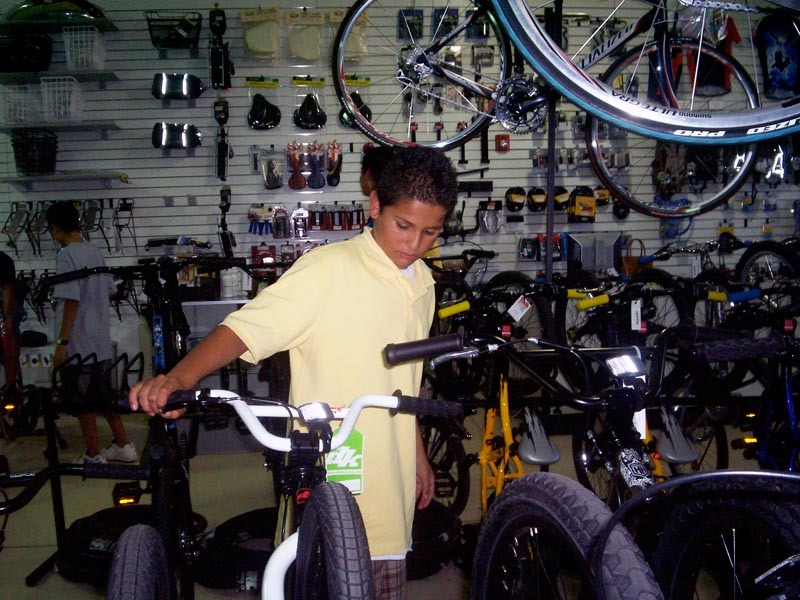 The bike turned out to be therapeutic and he bought more bikes for more kids so they could ride and talk. Put boys and bikes together and the next thing you know, they want to race. And that's how the bike racing club was born. It looks like Christmas just keeps on coming for the bike club. 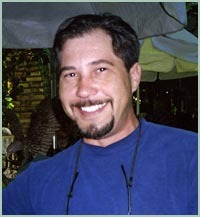 We just heard that in response to the latest press that came out, they received an additional $4,900 in contributions. That's fantastic! John spent his Christmas break training with his racing team. 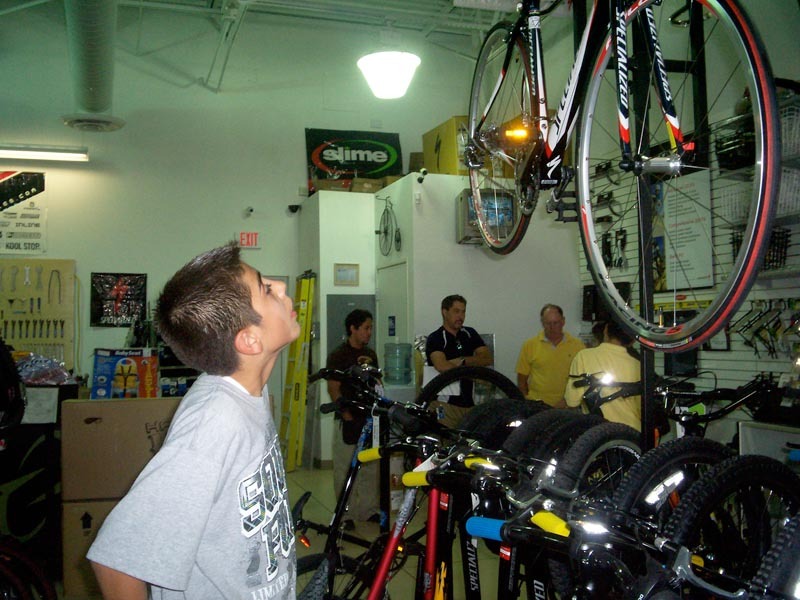 The kids had a chance to give a little back by cleaning and fixing donated bikes to be given away at Christmas. Together they fixed up 13 bicycles! Congratulations to John and his racing team. I just called during the team Christmas party with some big news. They are getting a second grant of $25,000! We are so impressed with what John is doing for these kids and with the dedication the kids have to the program. As many grants as were given this year, Damon and I found ourselves around $25,000 under one million. And since I committed to giving a million in 2008, this way I fulfil my obligation, and John will be able to expand the the program to another school. "The pride and accomplishments, the change in attitude, the change in lifestyle is nothing short of incredible," says John about the strides the kids have made. "I have been a teacher in this community for eleven years and I have seen nothing like this." We are so proud of this man and look forward to even more kids having something great to be a part of. 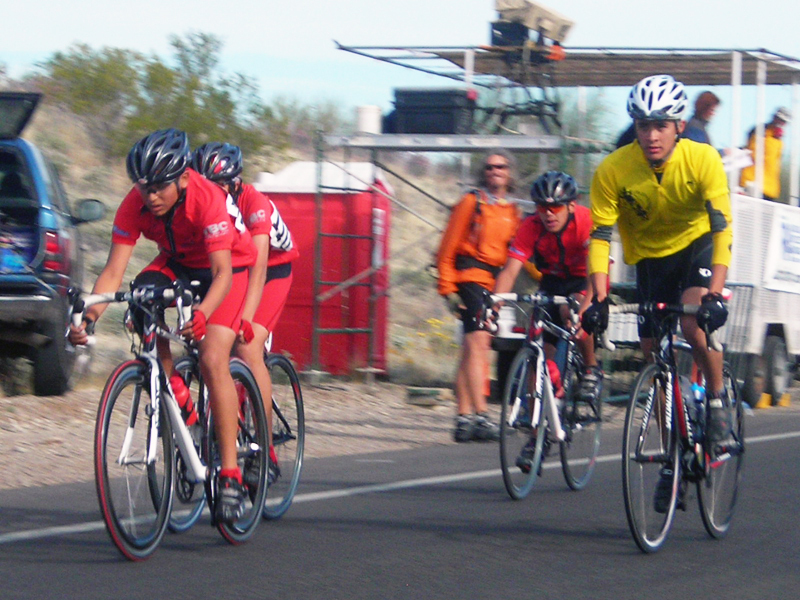 John's bike racing team competed in their first charity race, the famous "El Tour de Tucson." 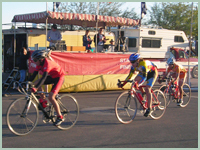 He had ten riders race in this event which is the largest of its kind in the country. This year there were 8,600 riders competing. They competed in the 66 mile and 35 mile events. "Well, we finally concluded our last tryout before the season! We had almost 20 applicants show up to the clinic and we narrowed that list down to 8 candidates. I gave the team the option of taking Saturday off since Friday night was halloween, but the kids wouldn't hear of it! (You know Jenny, you made an impact in a kids' life when they would rather train than go out and party.) Saturdays tryouts were amazing! Only two riders where unable to complete the gruelling 25 mile course and we ended up selecting another girl and three boys for the team. We also selected another boy from 5 applicants to be an apprentice mechanic for the team. 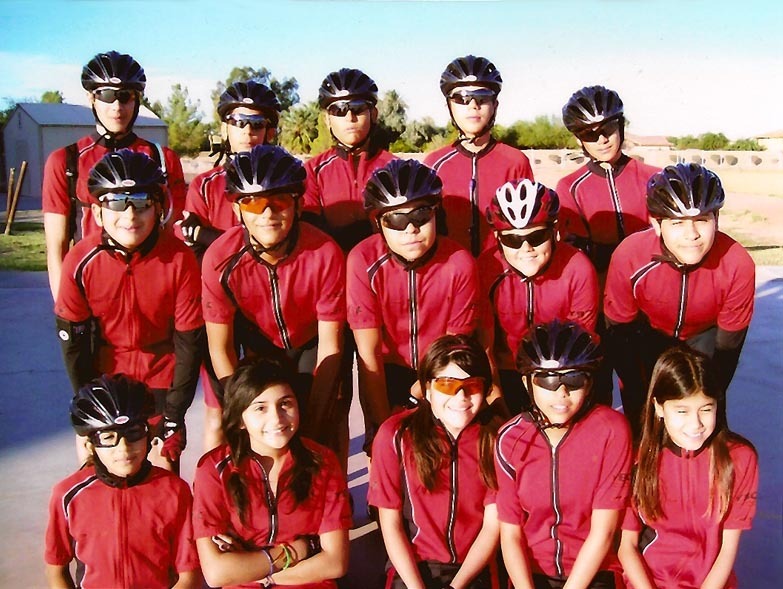 Since your donation we have added 15 kids, 3 adults, merged with Yuma Bike Club, and created an entirely new training facility. Monday we are having the sponsor ceremony with Time Warner Cable." These kids are getting good! 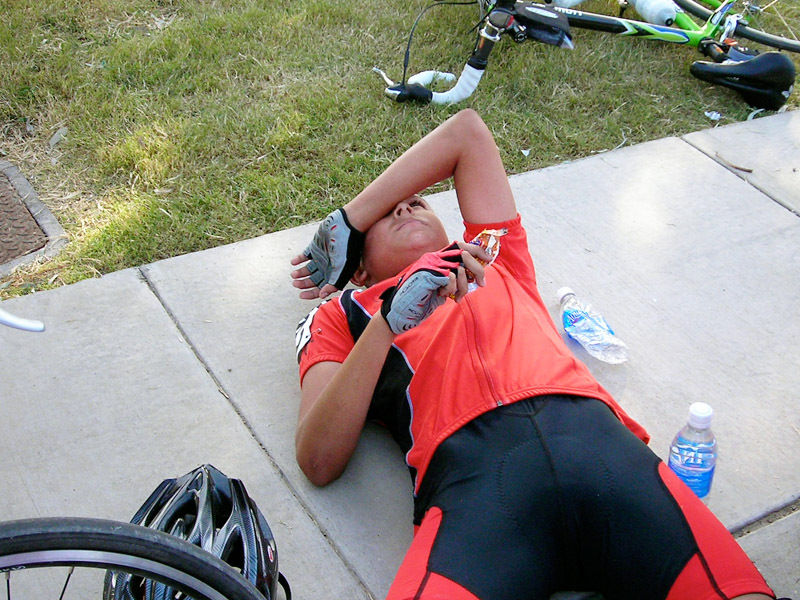 On Saturday we rode 30 miles and fought some viscious headwinds. The lead group still shaved almost two minutes off of last week's time. (Guess the formation practice in the parking lot is paying off?) We have a new team secretary and she has sent out over 100 mailers to local businesses. We have already been approached by three new potential sponsors and have set up a new account for the money with the school district. We will be holding more tryouts for the girls' squad, we have eleven potential applicants and are looking to fill 3 more slots on that team. Coach Madrueno is doing a fantastic job with the girls, soon they will be giving the boys a run for their money!" "Who said that today's generation is lazy?" says John. They conduct drills in the parking lot where the kids are practicing and learning how to ride in close proximity to other riders. We love what John is doing for these kids. 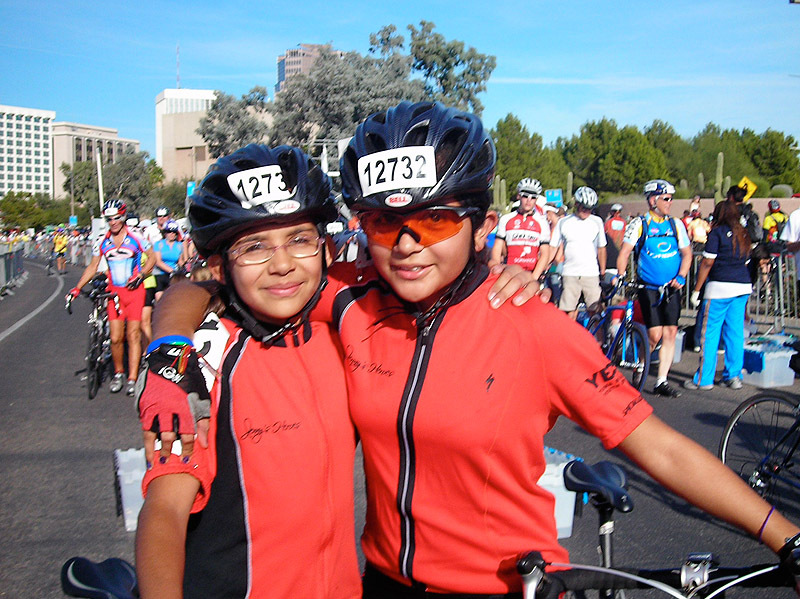 For their rides, they meet at 6:15 am and ride a little over 31 miles. These kids are dedicated! With practice and school they log 12 hour days and get up at the crack of dawn on a Saturday! And John, we love your photos! 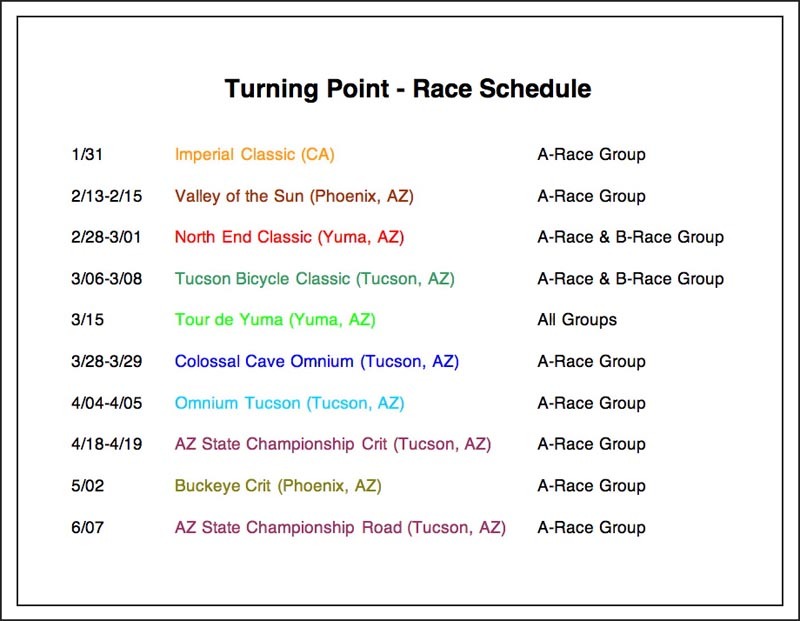 Team Turning Point is looking good! We just got some new team photos of the kids and their equipment. They added 4 girls (one not pictured) and two more boys to the team. 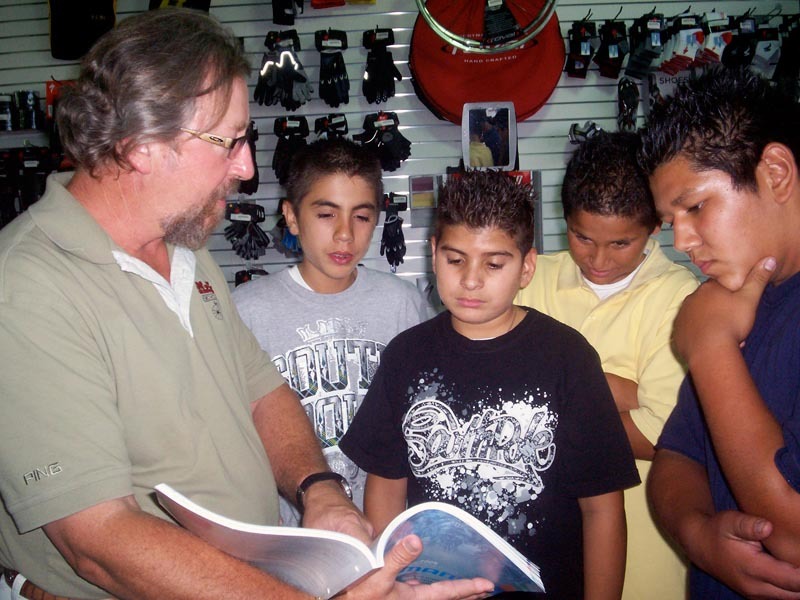 John's team had their his first clinic last week and 12 new riders attended. They will select 8 for try-outs. They also had a bike fitting, a speed course and bike familiarization, and finally a 25 mile road ride followed by a spaghetti lunch. 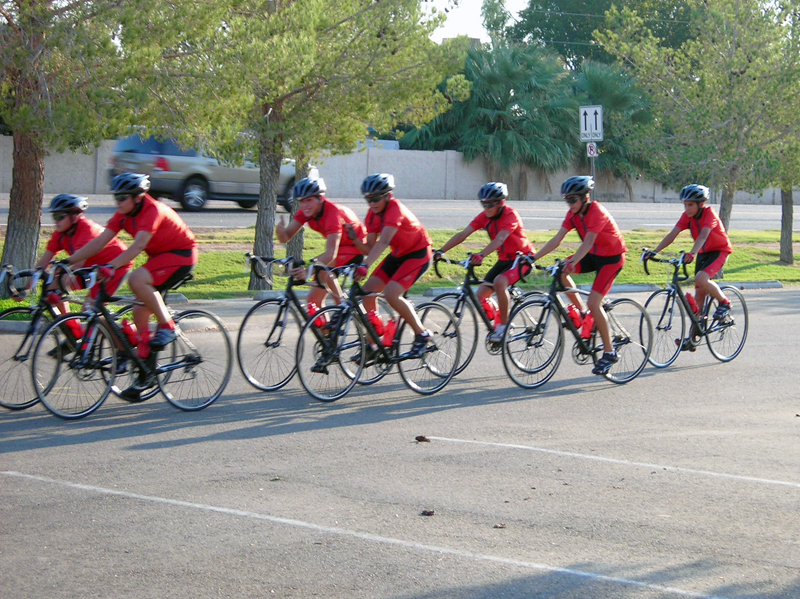 Between volunteers, coaches, & current riders they have about 20 people on the road! 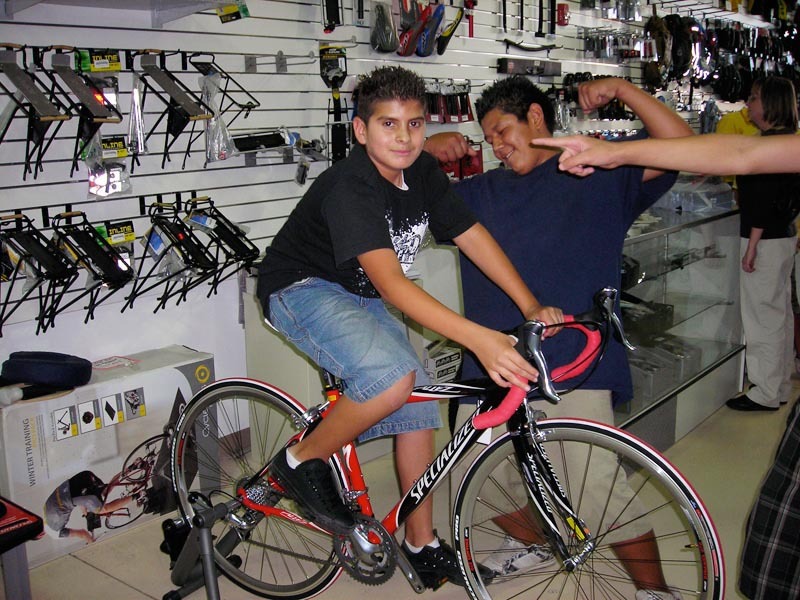 They're also currently building a time trial bike as well as rebuilding from the frame up some older bikes for the kids to keep. Oh, and John sent us a sample of their new water bottles with great looking logos. John tells us they are having open practices right now, letting kids who are interested join them for training to see what it is like. For two weeks it has been a packed house! He imposes a limit of ten new riders and has had to send kids away so many show up! In a few weeks they will start holding clinics and try-outs. 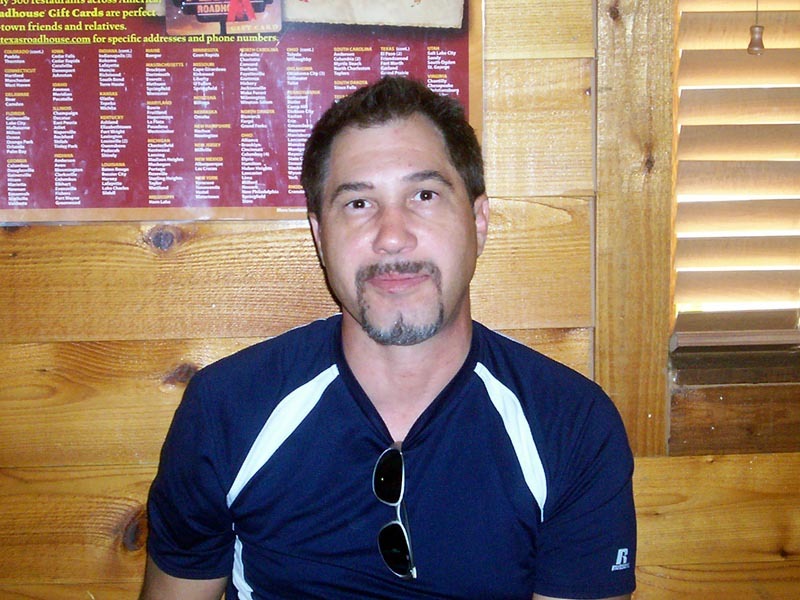 "With all the troubles our local schools are facing," says John, "this program is such a bright spot. It really makes me glad to be able to meet with these kids and provide them with a healthy sport and comraderie." It makes us glad too, John, and congratulations on the start of a great season! 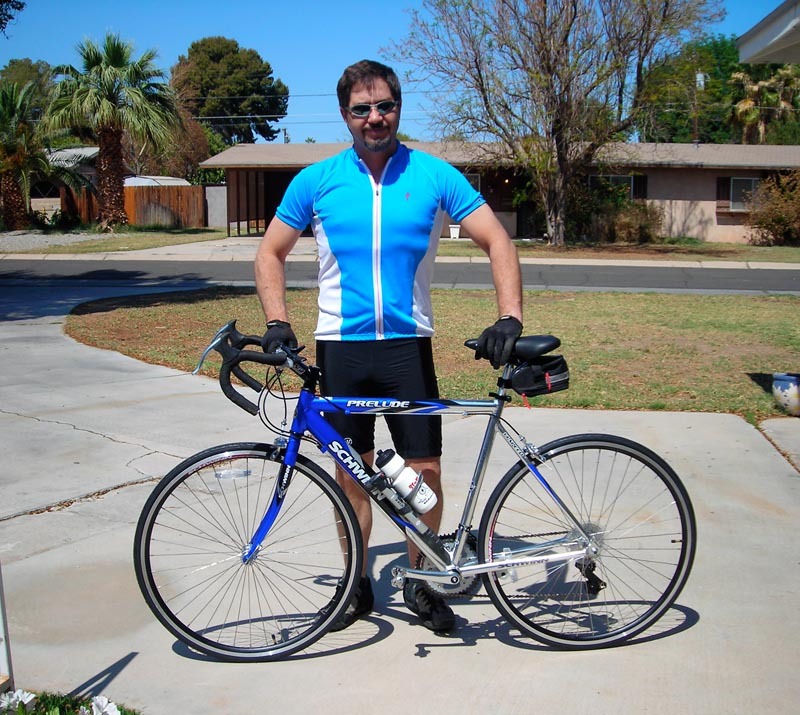 John sent me an email about a Saturday bike ride down highway 95 that reads more like a movie script and I hope everyone will read it. It illustrates his passion for helping others, and it shows you just how much one person can do... how many lives he can touch...how powerful a role model he can be. Today was a good day. I met up with four of the boys and coach Madrueno at 5:30 am for our Saturday ride. 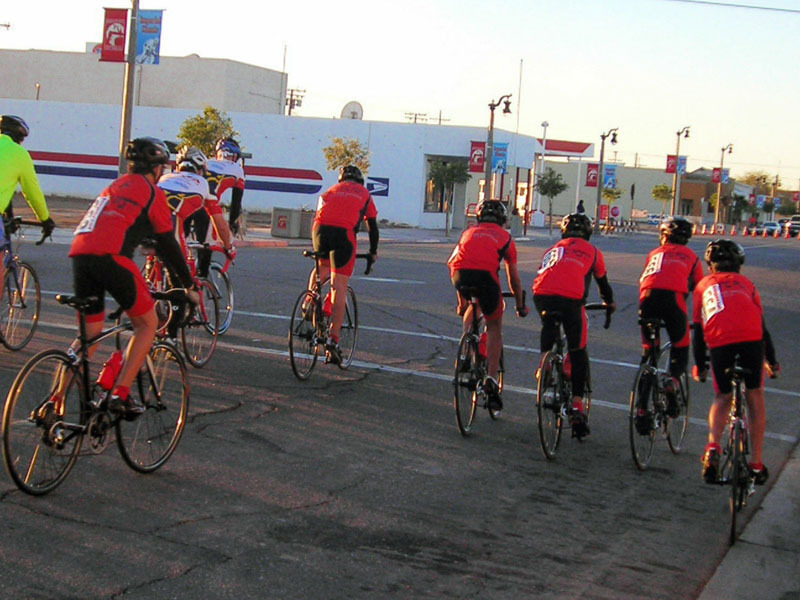 We planned on riding with one of the local race teams, Sahara Racing, and other members from Yuma Bike Club. All together there was about 20 of us that left out of the parking lot for the ride. By 6am it was already 97 degrees out! We headed out Hwy 95 in a double pace line. 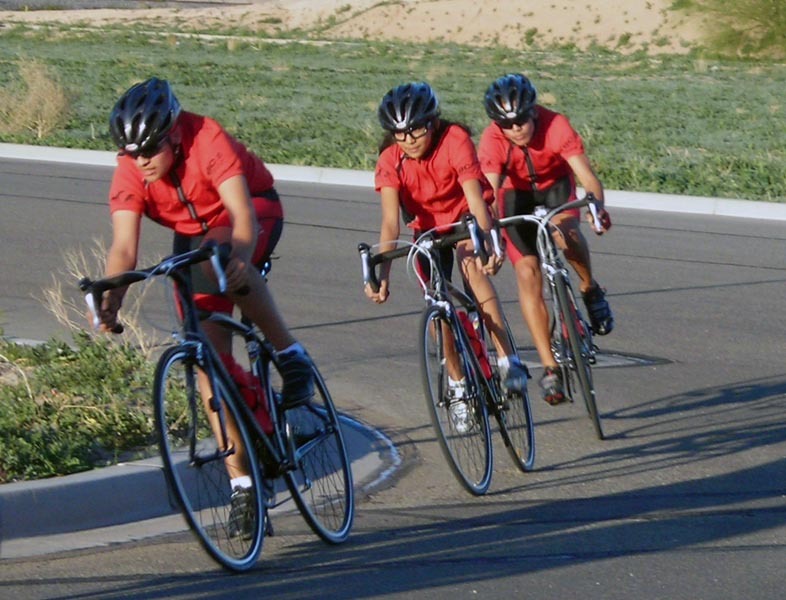 I was riding in the back and couldn't help admiring my group in their matching red and black riding gear and black bikes. 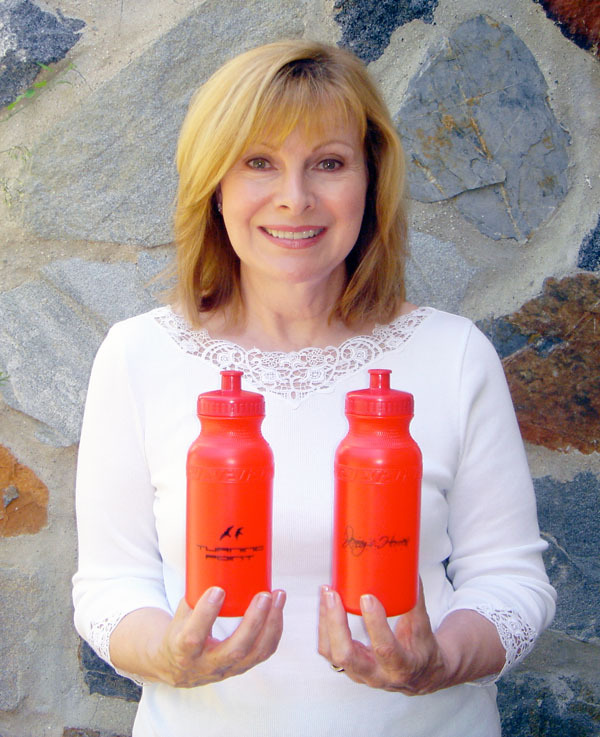 Even the red water bottles matched. 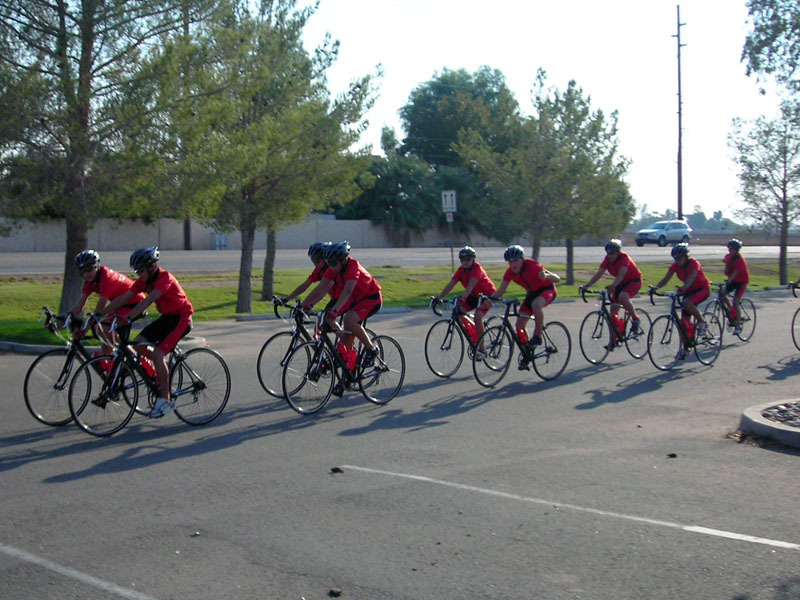 They rode smartly for about five miles pulling together as a team and taking turns leading and drafting. We were doing over 20 mph at this point and there was no more than a few inches of space between the wheels of the riders. Then came the first hill. It is not a great hill but it has a heck of a steep grade. Angle of course flew up the hill effortlessly, that boy is a natural climber, even passing the Sahara Team with ease. The groups thinned out and separated and I found myself pulling lead with three boys in trail behind me. We hit the 25 mile mark within an hour and 10 minutes, holding a 21.5 mph average. Not to bad for some kids who had never even rode a road bike before a couple of months ago! By this time it was 102 degrees outside. We stopped at a Circle K for some ice and water and I bought the boys candy bars. To be honest, I am always amazed at the transformation that comes over these kids when they ride. One of the boys always wears baggy clothes over his riding gear because red is the rival gang colors, off the bike they are tight lipped and tense, on the bikes they relax, smile and joke...they are kids again! Coach Madrueno was somewhere in the rear group. She called me to say they would meet us in a small town midway on the ride. I was so happy for Coach Madrueno, she told us today that she was finally pregnant after trying for the past few years. The boys were so happy for her and protective. They were so worried she shouldn't be riding! One of the boys stayed behind just to keep an eye on her, playing the role of mother hen! We hit the Hwy again and gained some speed on the long smooth road. The wind started picking up and gusting and I was glad all of my boys had decent eyewear. Before they used to get so much grit and dirt in their eyes blowing off the plowed farm fields that their eyes would be red and teary, but now the new wrap around glasses you bought us work fantastic! I keyed my ipod to some AC/DC and picked up the pace. I could tell by the shadows that the boys were right behind me. Four silhouettes against the pavement. My speedometer was reading 23 mph at this point. (Another item we bought with your money and makes a huge difference, each boy has a bike computer.) By this time it was 105 degrees out. 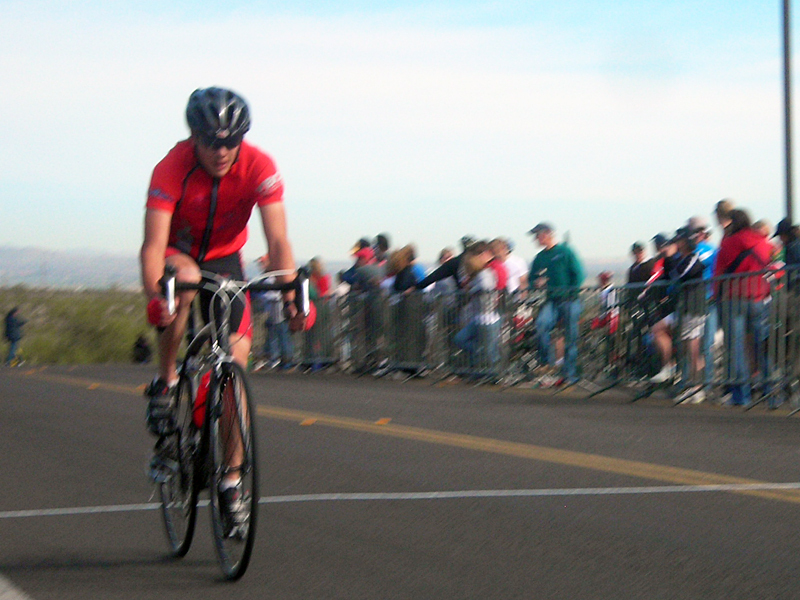 We crest the mesa on our final climb and enjoy descending, hitting speeds over 36 mph on the way down. Behind me I hear the boys laugh with the sheer joy of going fast. By now we have covered over 40 miles and legs and butts are feeling the strain. Yet when I accelerate they match me pedal stroke for pedal stroke. It is moments like these when I truly love these hard-bitten, frowning kids from the streets! There is no quit in them and to stop them you would have to kill them. I push a little harder, trying to break them up a little, I try tricks like swerving and changing speeds. They stick to me like glue. We pull into our staging area with exactly 50 miles on the computers. We finished the ride in 2 hours and 20 minutes, a 21.42 mph average. Today it hit 106 degrees with 30% humidity and gusting winds of 19 mph. We fought the heat, the hills, the wind (which always seemed to be against us!) and won. We rejoin coach Madrueno and her shadow, tease each other about speeds and who pulled who. The boys are drenched, caked in sweat and salt, but they are happy. And you know what? So am I! Thank you so much Jenny for your gift. You really do not know what a difference you have made. To be honest I do not care if the boys ever compete in a single race, just seeing the transformation in them when we do these training rides, the pride I feel when they accomplish something great, I wish I had the words to convey the emotions. You did, John, and thank you for making us proud. John got his bikes! He says they are beautiful - black with white and silver trim, light-weight and with indexed shifting (that means no more dropped chains). The kids love them and couldn't wait to get on the road. They've already put 100 miles on them. 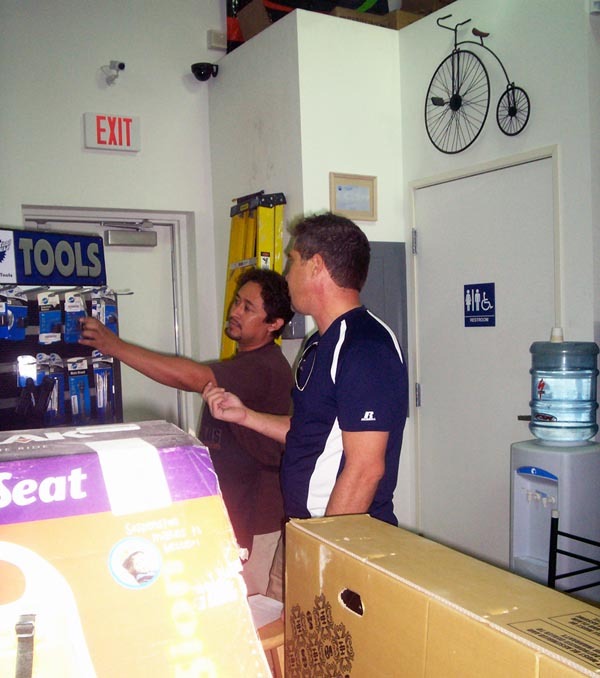 Thanks to John's wheeling and dealing, his initial shopping list has more than doubled! He will have enough clothes and shoes to last for at least three years and should be able to mount between 15-20 kids! He sent us these pictures of the new bikes, cycling gear and uniforms. 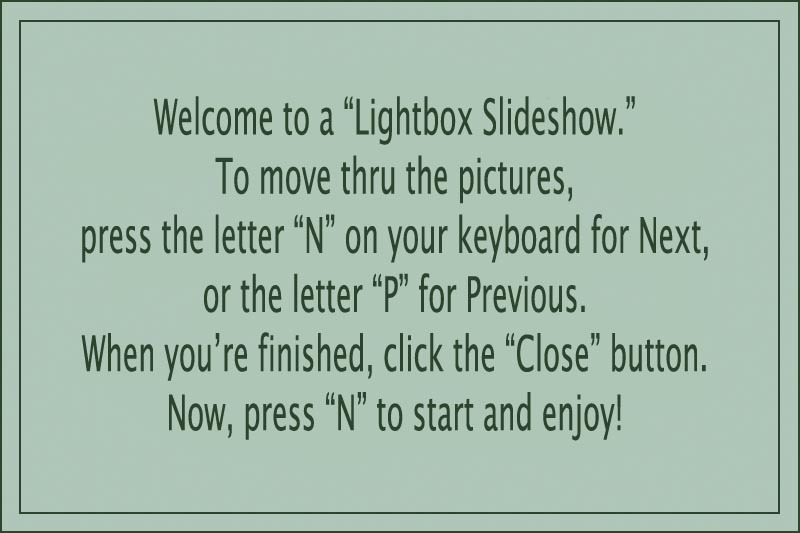 It's exciting just to see the pictures so you can imagine how thrilled the kids must be. The kids are busy revamping the bike room, building bike racks, putting up posters, and painting. Their plan is to have it all ready by the end of summer to hold some bike clinics and tryouts. "I am so proud of the team and the difference is already amazing," says John. 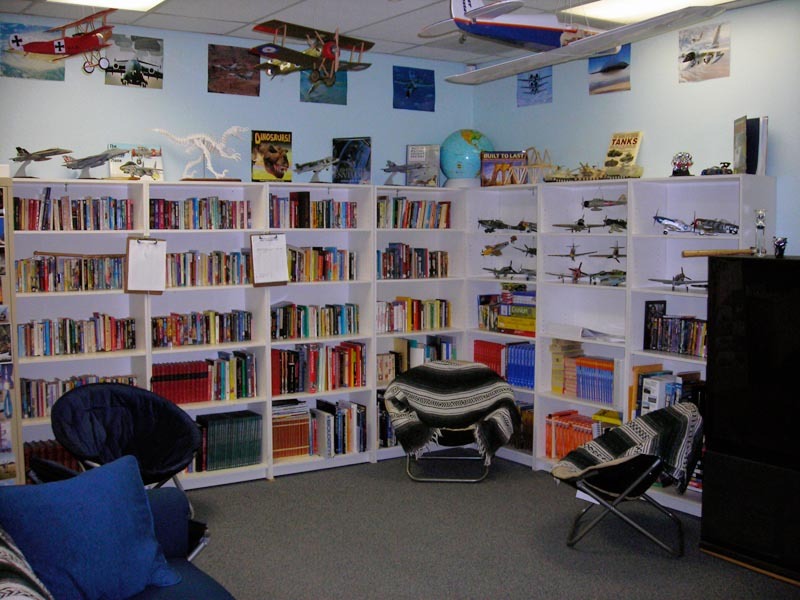 "I have always believed that environment has a big impact upon behavior. Dress the part and act the part and pretty soon you will become the part. This is true of my kids. They are already feeling like champions!" We hear the kids can hardly contain their excitement. "I keep telling them we will have everything together by the end of the month," says John, "but they still ask EVERY DAY if anything has come in! You must realize that for these kids they do not get much in the way of gifts so this is like a thousand Christmas' wrapped into one!! The support crew is busy building bike racks to hold 20 bikes. 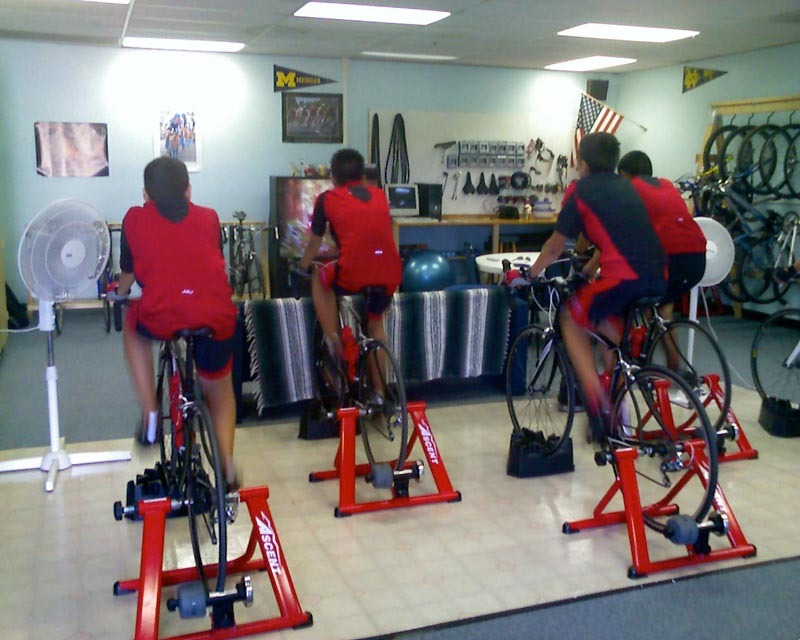 The four new riders are riding every morning and doing an hour of spin class working on conditioning. 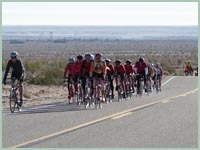 The temps are hitting 113F here so we try to have the road riding done by 9am, then move our training indoors. 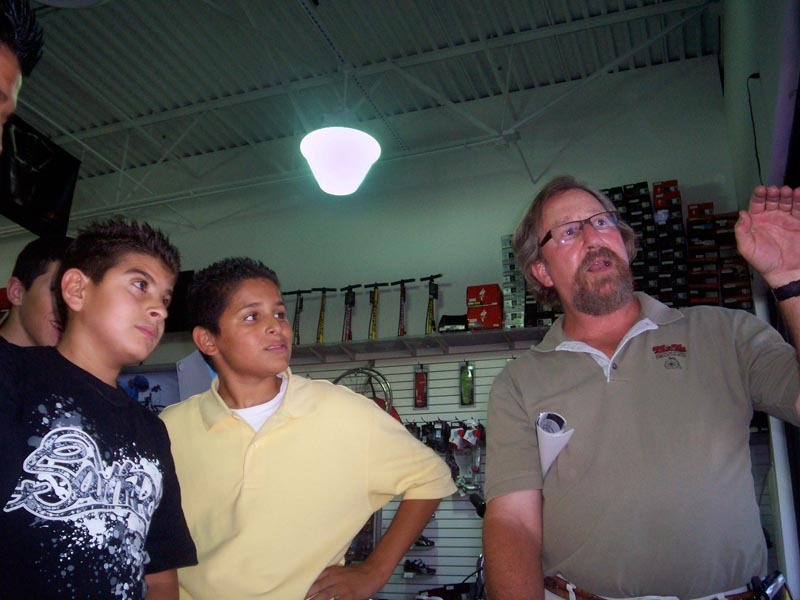 The kids are also discussing what races we will compete in for the 2009 season." All the bikes are on order and John just ordered new helmets, gloves, socks, and other gear. I'm with the kids: "When are the bikes coming!!!??? Are they there yet?" I can't wait! "I cannot say what a difference Jenny's generous contribution has made. Already two kids who I was losing now want to clean up their act and come back! The kids are celebrating and training hard. 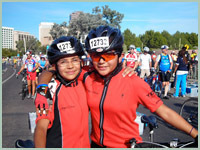 We have already ordered 15 bikes and riding gear for a dozen riders. I need to also thank the other teachers, Mrs. Cinthia Madrueno and Ms. Jennifer Deer, they are the heart and brains of the program! 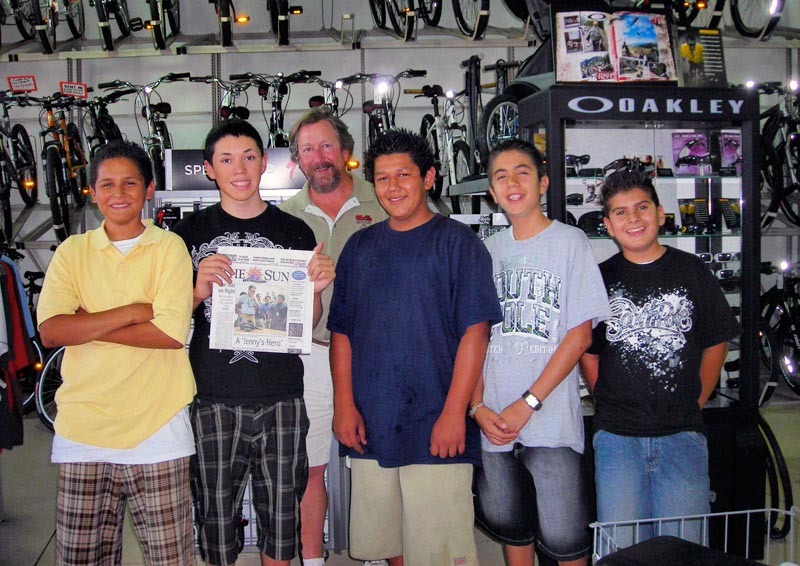 Also thank you to our local bike shop, Mr. B's Bikes of Yuma for helping us stretch our dollars and fill some very big orders! Ireally believe that this donation will have a ripple effect. We are already able to apply for matching funds and could easily serve twice as many students within the next few months. Thank you Jenny!!" I spoke to John this morning and he's still recovering from his whirlwind day on Monday. His phone rang off the hook and he even heard from an old friend who served with him in the Marines 17 years ago! John celebrated his good news by taking his kids out to a steak dinner and to the local bike shop. He's also taking the support kids to the tool store. This is the team that maintains and rebuilds bikes, in fact they got so good at it that the bike shop will let them work there over the summer. With our grant money, John will be buying fifteen new bikes which is more than the six he originally planned. 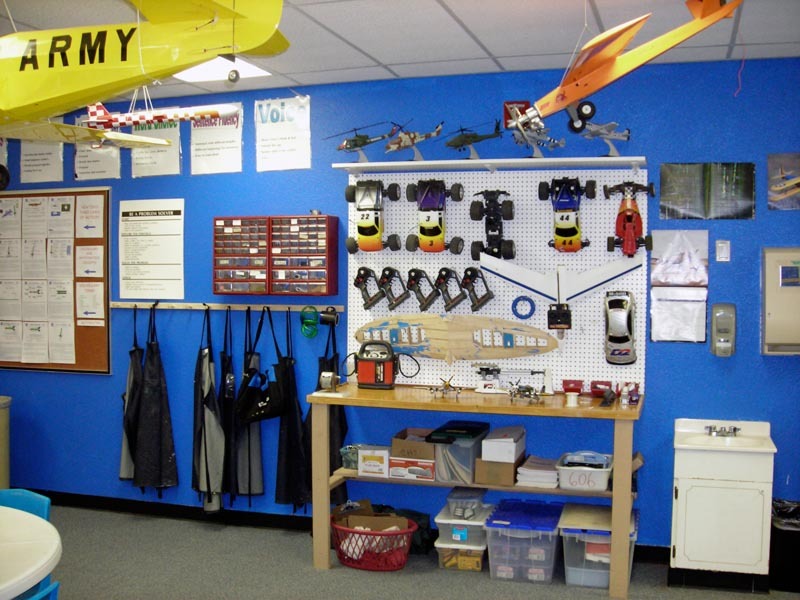 And a ripple effect has already started: Two more teachers have offered to join the team, volunteering their time, and the school district has approved them as an official after school program so now they will have liability insurance and some new space to use as a workshop. And John is moving quickly. 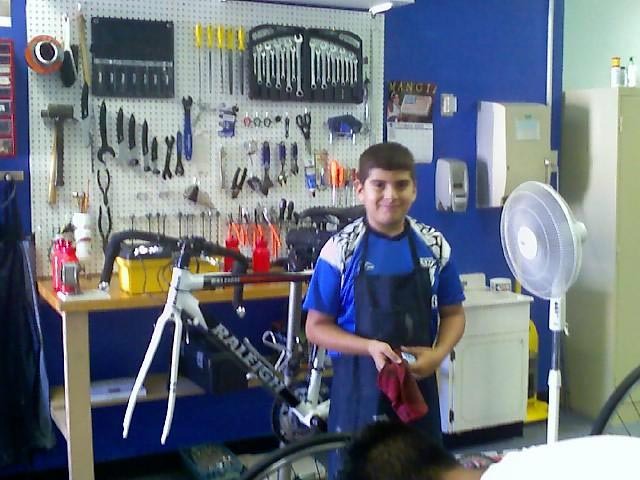 He has already ordered new uniforms and protective eyewear, still working to get the best deal on the bikes. By the way, John is recovering from shoulder surgery and at the same time, his 94-year old grandmother broke her hip. John's injury was from a biking accident and grandma's happened when she jumped a block fence to visit her 80 year old boyfriend! What an exciting phone call this was to make. I surprised John at his school today with the news that he is our newest hero. We had a lot of help from principal Linda Huff and her assistant Dara Highland. 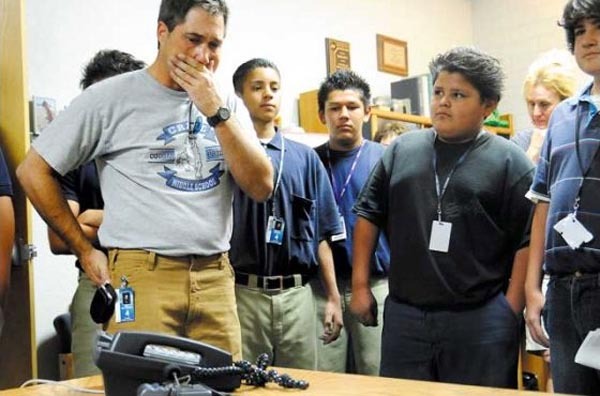 The phone call took place in the principal's office where everyone gathered, including other teachers, public affairs officer Chris Weigel, the TV news and local newspaper reporters, the local government channel, and then John himself who came in with some of his bike riders. When I asked why he only requested $20,000 John said, "I was afraid if I asked for too much I wouldn't get it." So I made it $25,000 on the spot because John said the more bikes he can get, the more kids can ride. Everyone was thrilled and it was great to hear their joy and excitem/ent over the phone. 6/09/08: Jenny wrote... "John, what a fantastic thing you are doing for these kids. I got goose bumps just reading about it. Who knows how much farther these kids will all go in life thanks to you." 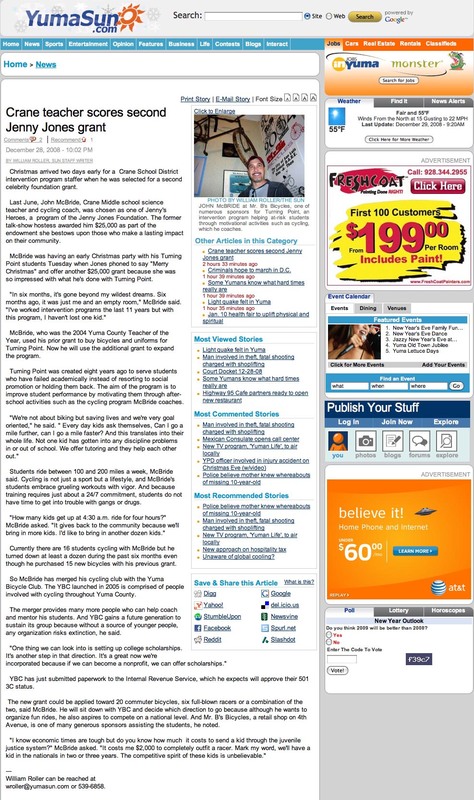 6/09/08: Damon wrote... "Congratulations, John! 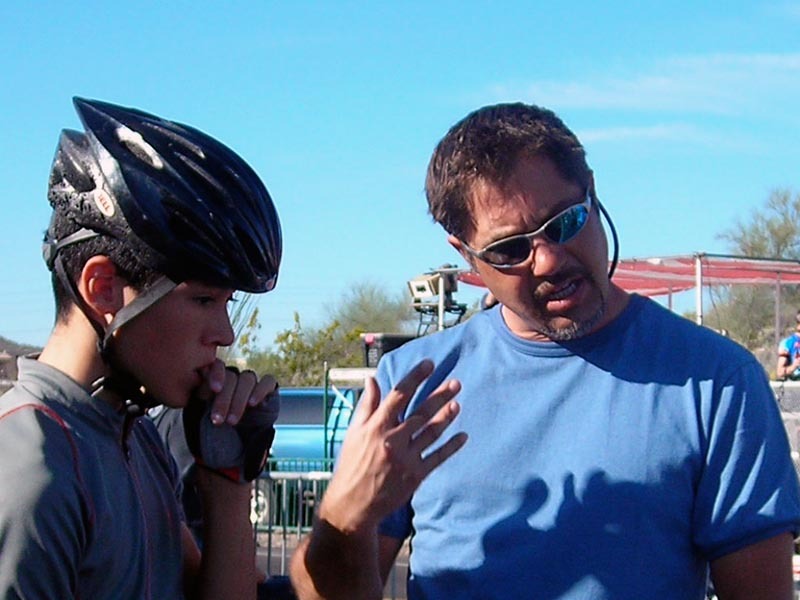 I really admire what you're doing for at-risk kids in Yuma... With your mentoring and coaching, and the new pro bikes and equipment you'll be getting, I wouldn't be surprised if one of your kids wins the Tour de France someday." 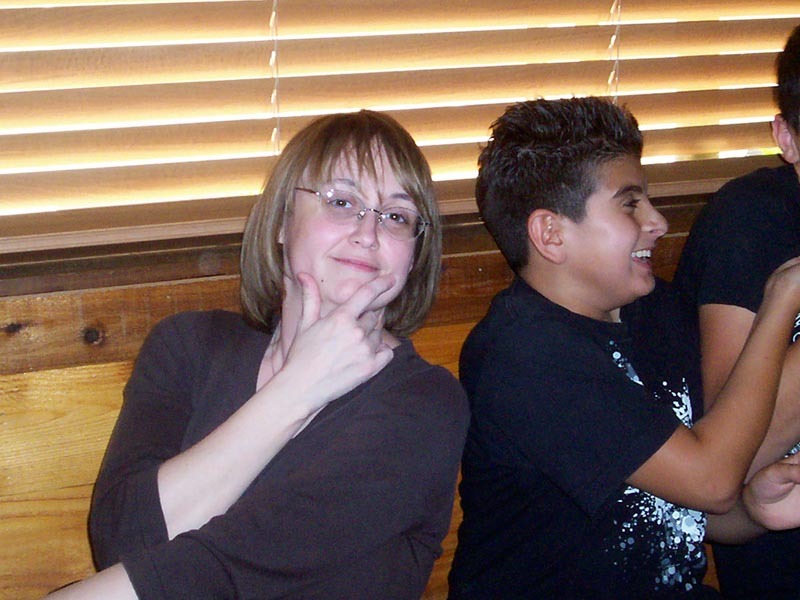 6/09/08: Terri wrote... "Hi John, in a society that is so quick to label and punish kids that don't have such a good start in life, you have proven what it takes to let their light shine. It works! Congratulations and blessings to you!" 6/10/08: Robin wrote... "What an amazing thing you are doing. All of our children deserve a chance at how incredible life is. It sounds like you took a big chance and are winning. Keep up the good work down in Arizona. If you ever take a bicycle trip along Hwy 2, stop here in Harlem, Montana. Bicyclists are always welcome." 6/24/08: J. Deer wrote... "Thank you for all that you do. It has been such so much fun watching the boys. They really are like kids on Christmas morning. I can't wait for the new bikes to get here!" 01/22/09: Dixie wrote... "I just relocated to YUMA for 13 weeks. 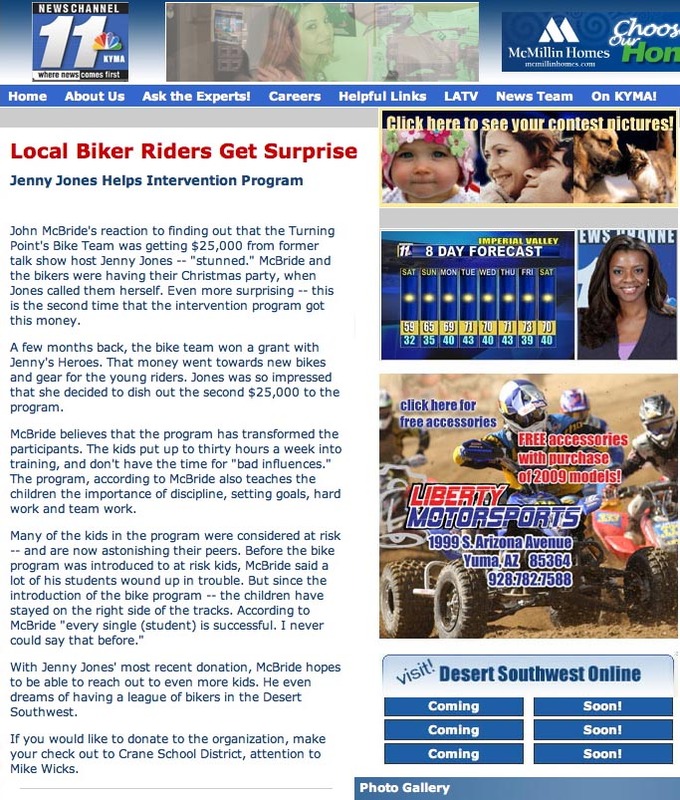 I am avid cyclist, and was looking for folks to ride with when I found Yuma bike club and also read about the youth program. 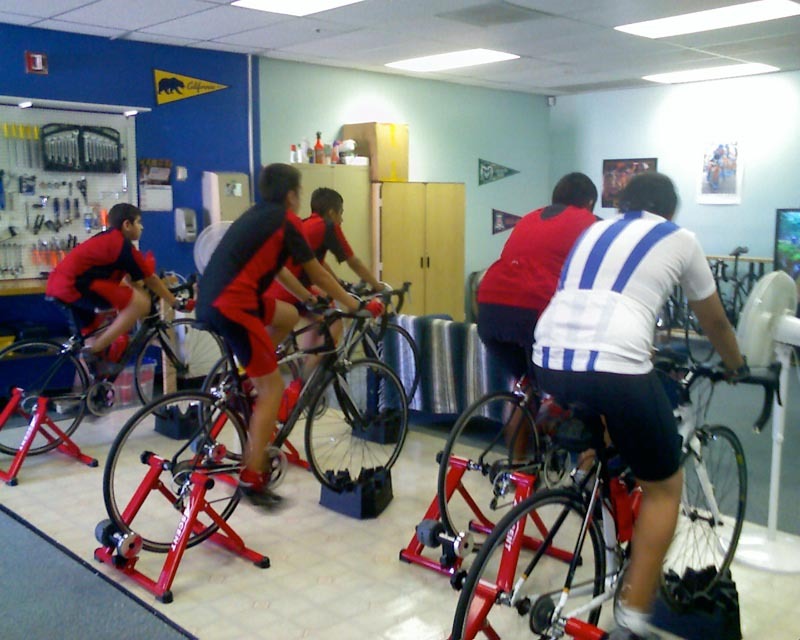 I have a long history of cycling and would be willing to work with you and the students. Please email me so we can get together."